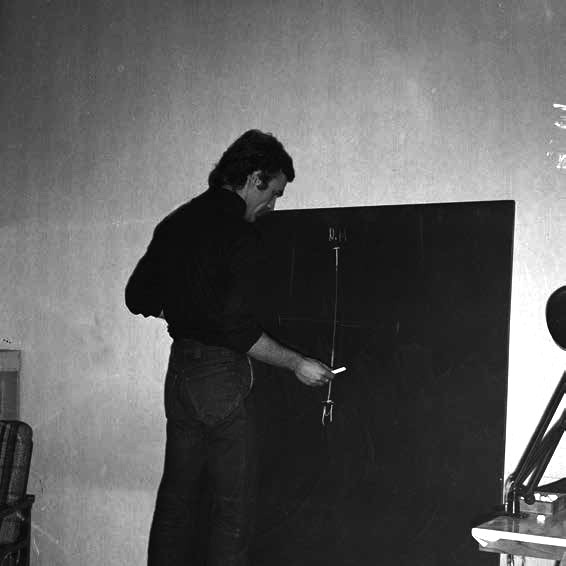 Participants: Giovanni Anselmo, Robert Barry, Stanley Brouwn, Daniel Buren, Victor Burgin, Jan Dibbets, Braco Dimitrijević, ER Group, Barry Flanagan, Douglas Huebler, Alain Kirili, Jannis Kounellis, John Latham, KOD Group, Sol LeWitt, OHO Group, Goran Trbuljak, Lawrence Weiner, Ian Wilson. 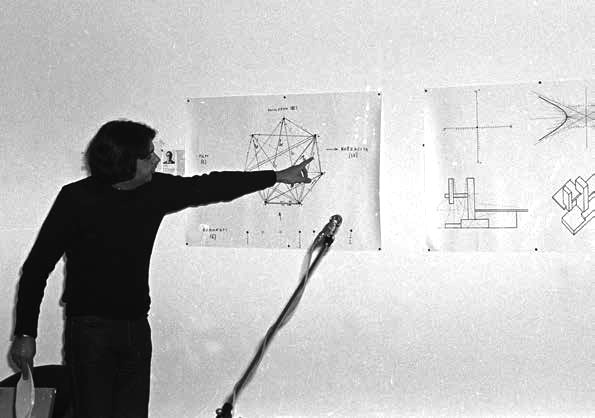 At Another Moment was important for (self-)educational processes within SKC that was based on the international exchange of experimental ideas and practices. 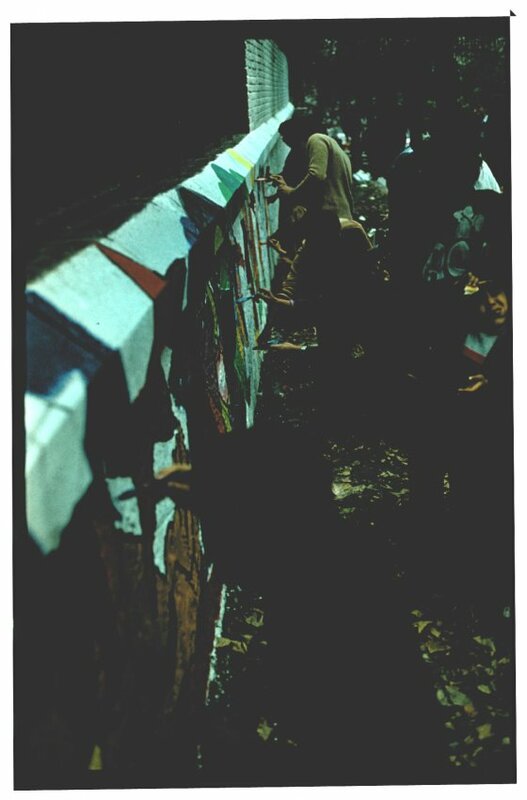 It also had a certain formative value for the process of instituting New Art in the local context because it gathered some of the most important artists from the West, guaranteeing the relevance of that practice within the local institutional and professional environment. 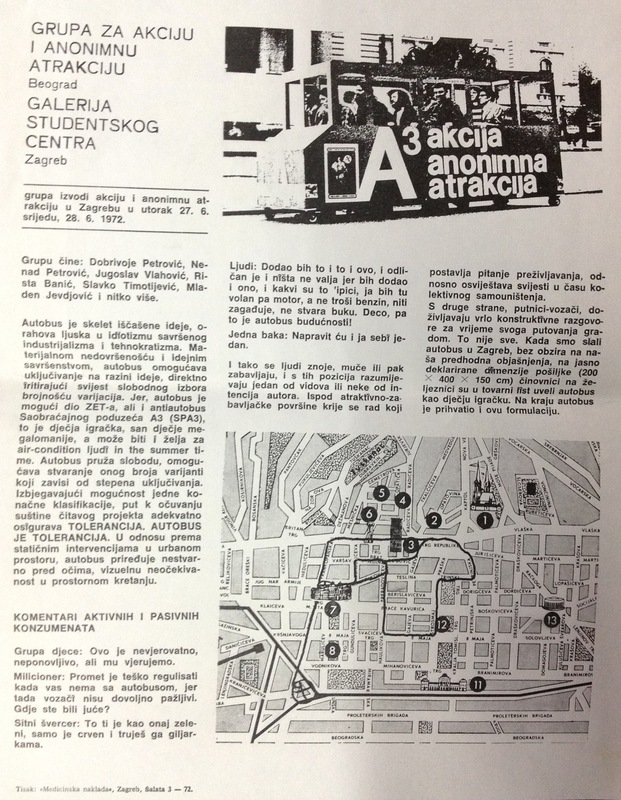 The exhibition is documented by representative catalogue designed by Nenad Čonkić and Braco Dimitrijević. 1 See: Ivana Bago’s entry on the exhibition At the Moment. 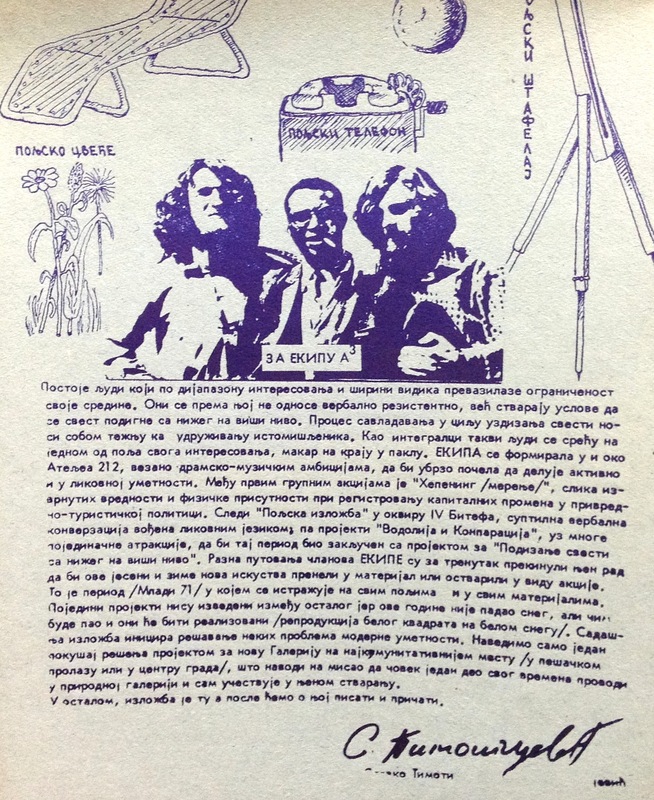 2 Nena Dimitrijević’s text the catalogue. 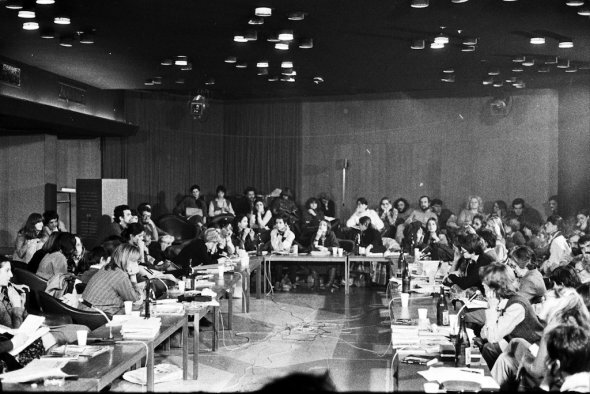 Participants: OHO Group (Marko Pogačnik, David Nez, Milenko Matanović, Andraž Šalamun), Ljubljana; KOD Group (Mirko Radojčić, Slobodan Tišma, Miroslav Mandić, Slavko Bogdanović, Peđa Vranešević), Novi Sad; E Group (Ana Raković, Čedomir Drča, Vladimir Kopicl, Miša Živanović), Novi Sad; Dragan Srečo, Ljubljana; Braco Dimitrijević, Zagreb; Goran Trbuljak, Zagreb. 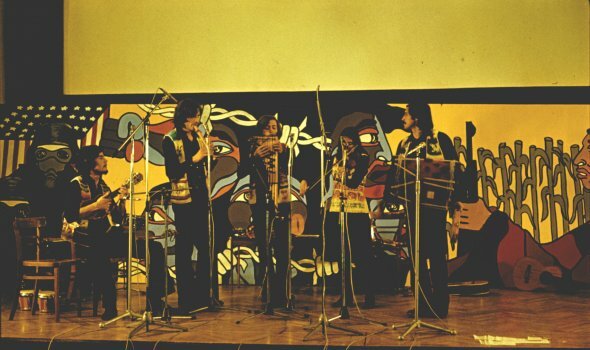 Participants: OHO Group (Marko Pogačnik, David Nez, Milenko Matanović, Andraž Šalamun, Tomaž Šalamun, Nuša and Srečo Dragan), KOD Group (Mirko Radojčić, Slobodan Tišma, Miroslav Mandić, Slavko Bogdanović, Peđa Vranešević), Novi Sad; E Group (Peđa Vranešević, Vladimir Kopicl, Mirko Radojičić), Miroslav Šutelj, Ljerka Šibenik, Mladen Galić, Ante Kuduz, Josip Stošić, Boris Bućan, Dalibor Martinis, Sanja Iveković, Braco Dimitrijević, Jagoda Kaloper, Gorki Žuvela, Goran Trbuljak, Bosh+Bosh Group (Slavko Matković, Balint Szombathy, Laszlo Kerekes, Laszlo Szalma), Slobodan Milivojević-Era, Zoran Popović, Raša Todosijević, Gergelj Urkom, Marina Abramović, Radomir Damjanović Damnjan, A3 Group. 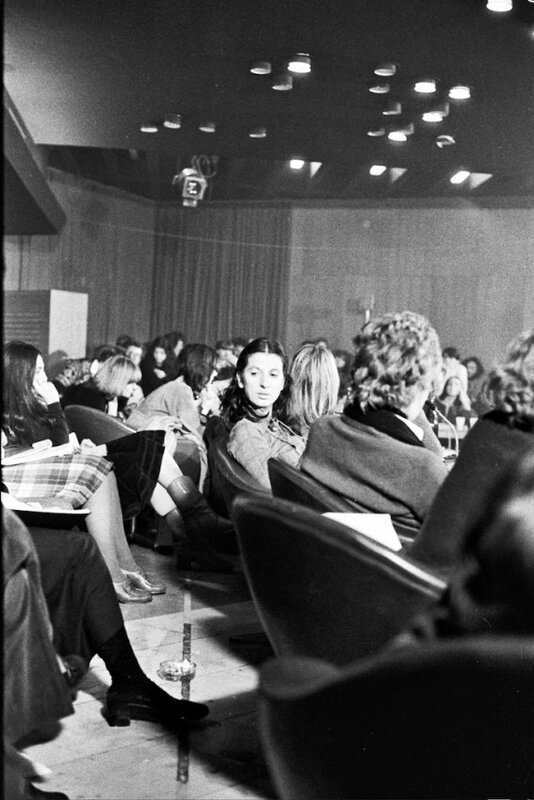 The exhibitions The Examples of Conceptual Art in Yugoslavia, Young Artists and Young Critics 71, and Documents on Post-Object Phenomena in Yugoslav Art 1968–1973 took place between 1971 and 1973 in the Museum of Contemporary Art, Belgrade, the most prestigious state institution of art. 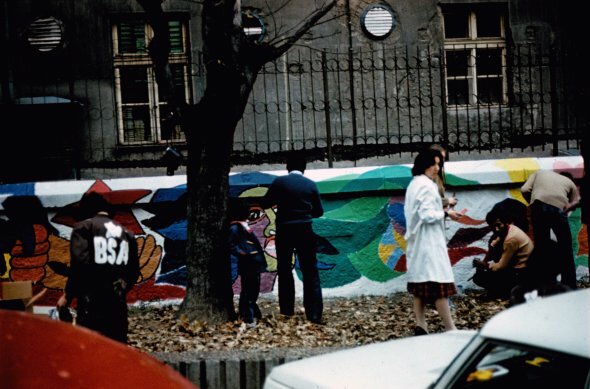 The three exhibitions can be seen as as a way of both promoting and systematizing (historicizing) the work of individual artists and artist groups operating in the context of Student Cultural Center (SKC) in Belgrade, or in other alternative youth centers in former Yugoslavia. 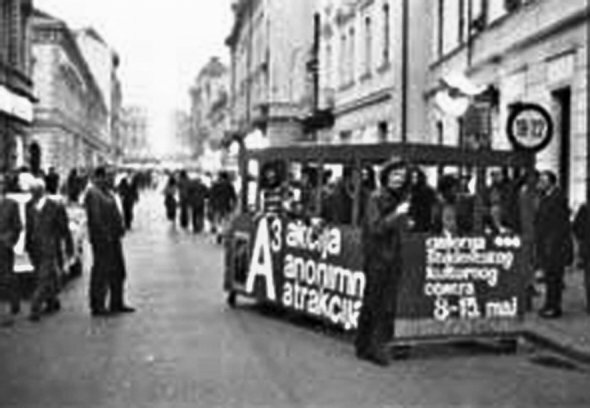 In addition, these exhibitions displayed the interconnections, interdependence, and mutual dialogues happening between the official and alternative art scenes in former Yugoslav space, proving that alternative art was not being developed in isolation from the “general public” as a kind of dissident activity, but was precisely part of the same “public sphere,” as the critical, shifting voice of younger generations of artists.1 In that sense, this chapter of the selected exhibition chronology could also fall under the title From Alternative Spaces to the Museum and Back. 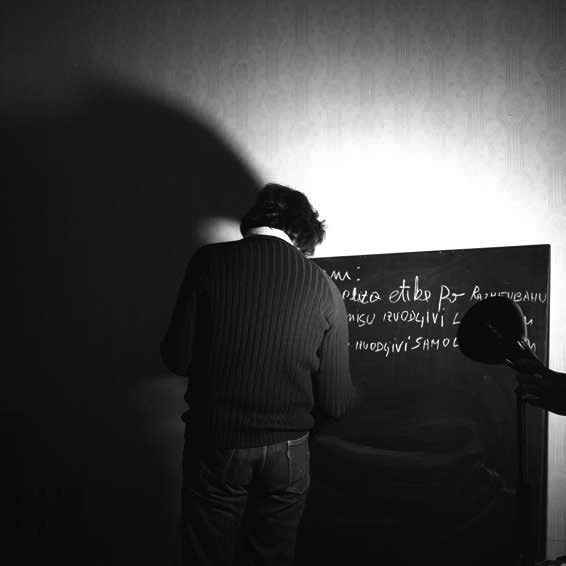 The first exhibition, The Examples of Conceptual art in Yugoslavia, took place in the Salon (gallery) of the Museum of Contemporary Art from March 3–22, 1971, and was curated by Biljana Tomić and Ješa Denegri. 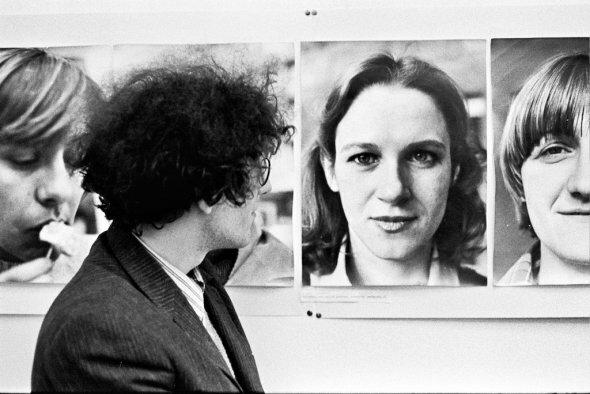 Conceptualized as an overview of the early examples of New Art Practices in the former Yugoslavia, the exhibition introduced Conceptual art to Belgrade cultural institutions for the first time. Precisely from this reason the exhibition was mainly structured around the issues of promotion, education, and information. 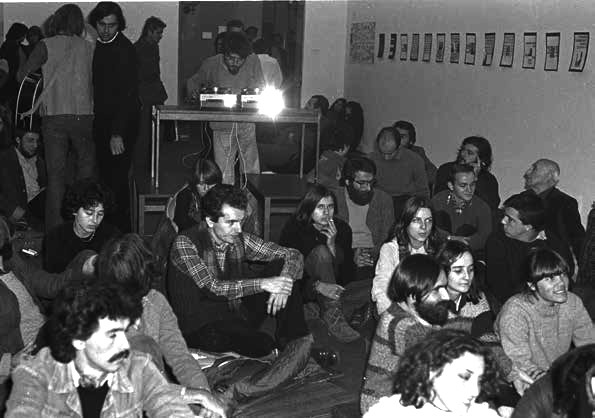 It can be observed that the presentation of the Conceptual art scene in the Museum of Contemporary Art preceded three experimental exhibitions in SKC, which happened in the summer and autumn of the same year (Drangularijum, At Another Moment, and Objects and Projects). 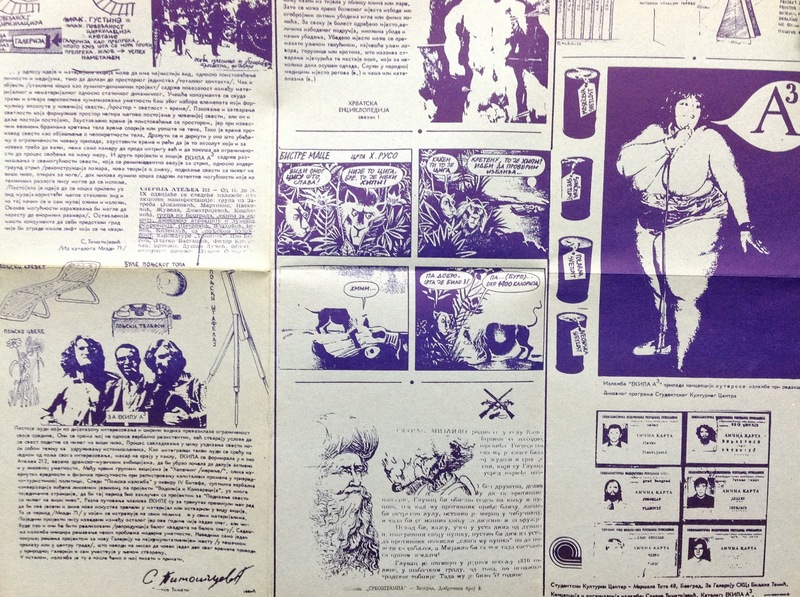 However, the SKC projects were always developed through the exchange within the editorial board of the gallery,2 which included the participation of Denegri and Tomić, among other artists and critics. 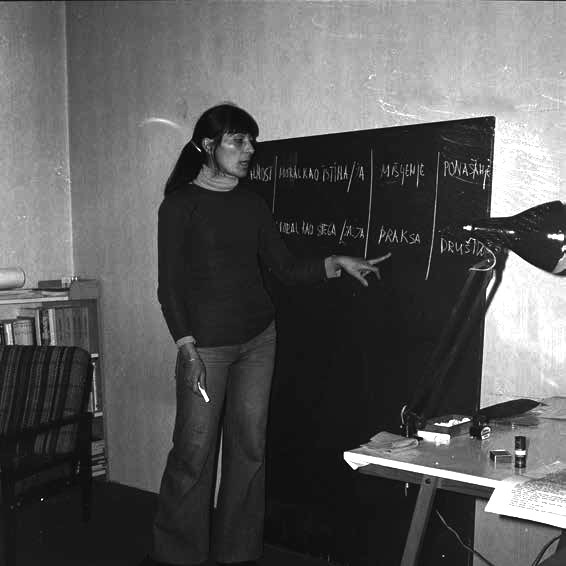 Aside from her later SKC activities, Tomić was one of the most active exhibition makers and freelance curators who collaborated with the Tribune of Youth in Novi Sad and the Atelier 212 – BITEF program in Belgrade. 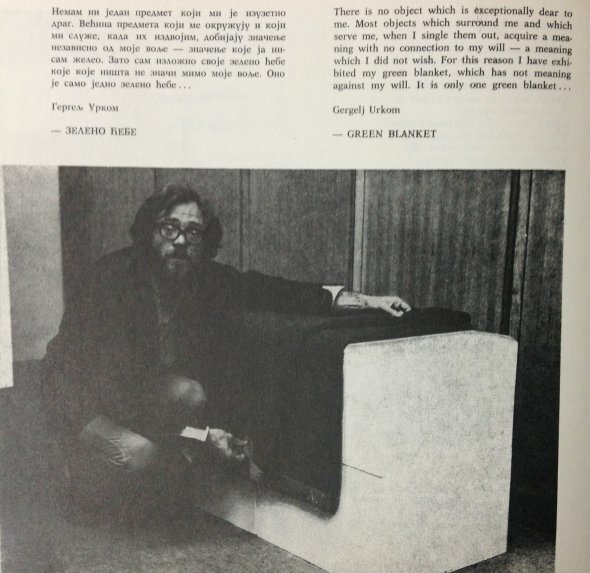 Both institutions were promoting ideas of New Art and theory, including experimental film and performative practices. 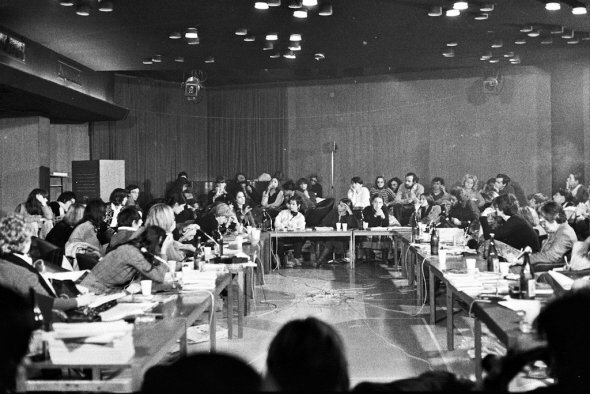 The second exhibition witnessing on simultaneity of promotion and historization of the New Art Practices opened in February 1972 under the descriptive title Young Artists and Young Critics 71. As part of the regular program, annual presentations of new artworks by the latest generation of artists were organized at the Museum of Contemporary Art. 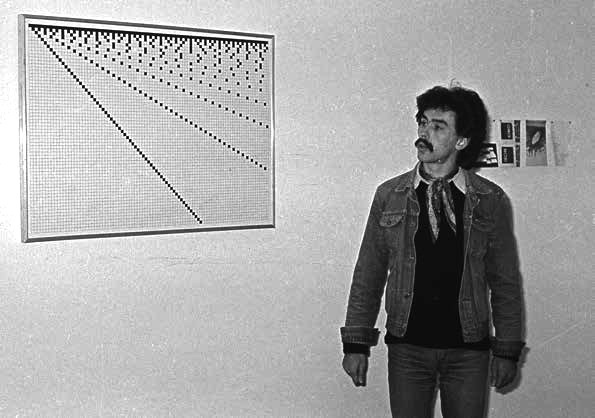 Artists were usually selected by members of the museum’s curatorial council.3 This exhibition, however, was not curated by museum council members, but by four young critics broadly associated with SKC: Jadranka Vinterhalter, Nikola Vizner, Slavko Timotijević, and Jasna Tijardović. They selected eleven artists and artist groups, mostly strong proponents of New Art. 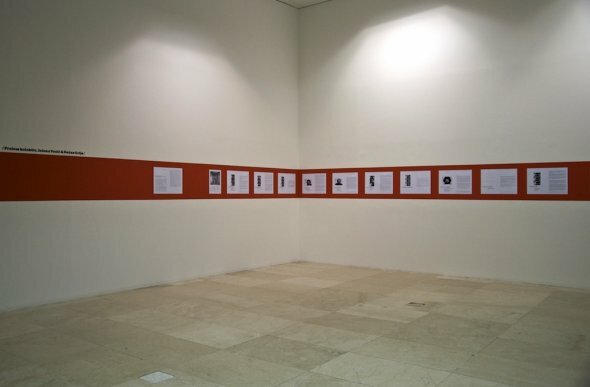 In contrast to the previous exhibition, curated by Denegri and Tomić as a self-initiated, authorial project, the exhibition Young Artists and Young Critics 71 was part of an official museum program. 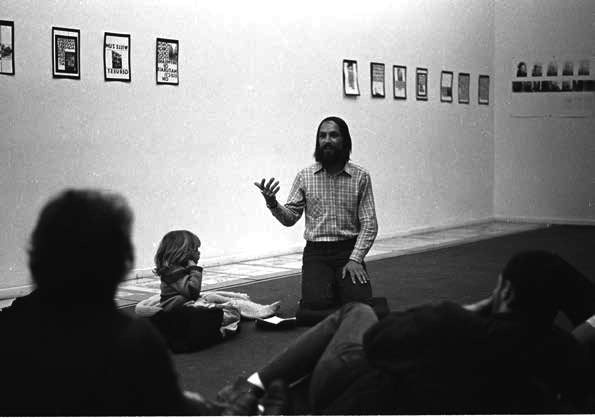 Compared to The Examples of Conceptual Art, the second exhibition was more heterogeneous and less “strict” in terms of the discourse of Conceptual art proper. 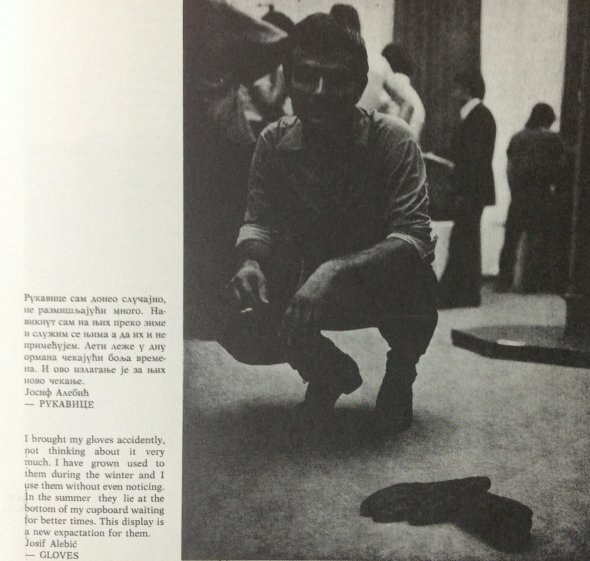 It presented a variety of work by young artists of the time, and included installations, performances, experimental films, text-based works, conceptual materials, minimal and hyperrealist painting. 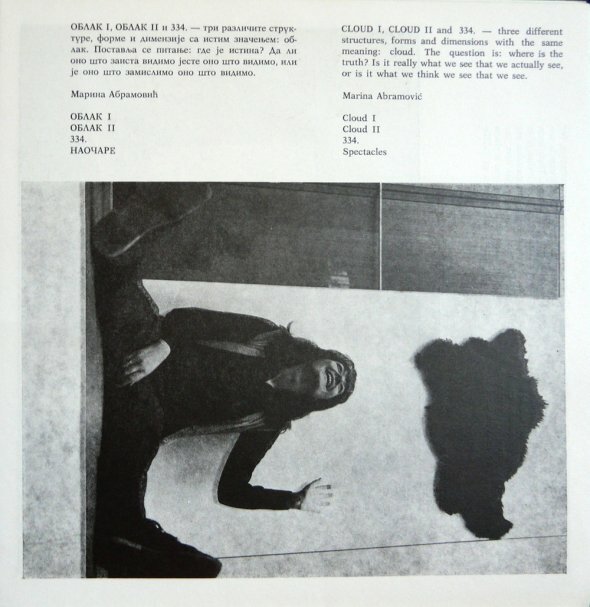 Despite transgressing the “purity” of New Art in the exhibition plan, the curators emphasized some of the important changes in the language and the art form in the catalogue texts, in a similar educative manner as Denegri and Tomić had done for The Examples of Conceptual art. 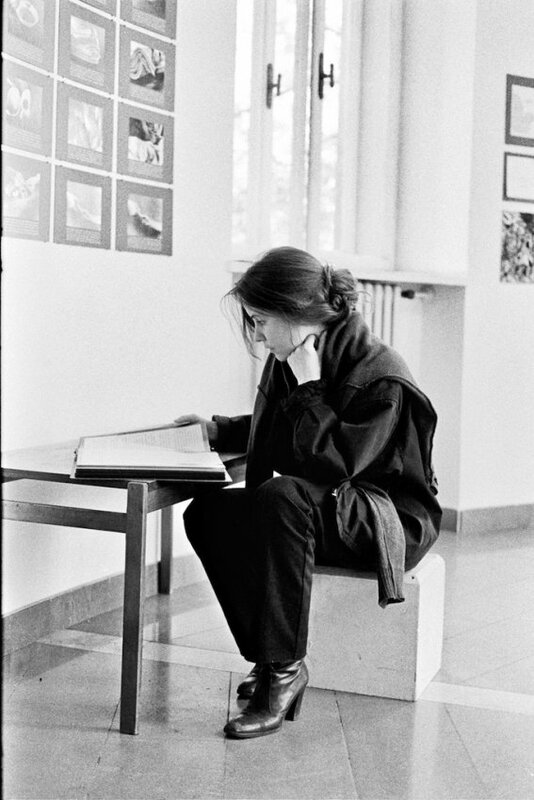 In her catalogue text, Jasna Tijardović interpreted the exhibited artworks and revealed her views on contemporary exhibition practice. She wrote: “The exhibition should not serve as a confirmation of existing values, but should hint at the new ways of artistic behavior. It should be an experiment. 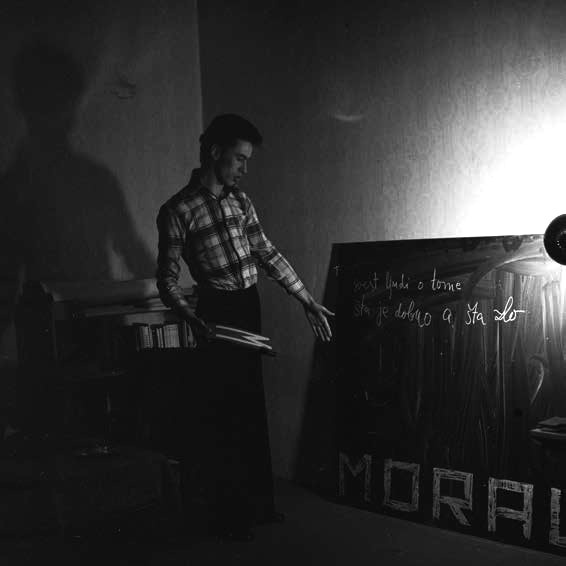 […] The goal of exhibition is not in presentation of particular development or in sharing a certain style-characteristics of individuals or groups, but in becoming an expression of the present moment situated between the art and life.” Slavko Timotijević focused on the change in the position of the artist at that time, quoting the member of the KOD Group Peđa Vranešević, who claimed there was a shift in focus from the primacy of the artwork itself to the primacy of the person behind the work. 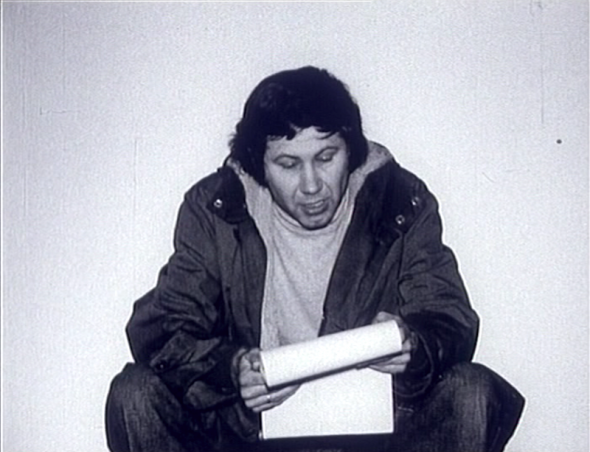 Timotijević concluded that “the artist ceased to be just the ‘Hand of God’—the one who invokes and reinvigorates the memories—becoming instead, through the power to execute out of ideas, the very God itself.” All the remarks, as to be expected, overlap with the radical change in production of art in which conceptual proposition by an artist often resembles God’s creatio ex nihilo (“creation out of nothing”). 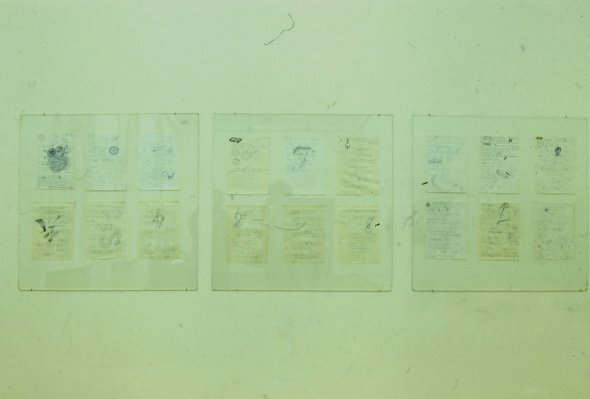 Finally, the third exhibition, was curated by Denegri and Tomić and presented in the Museum of Contemporary Art between June and July 1973 under the title Documents On Post-Object Phenomena in Yugoslav Art 1968–1973. 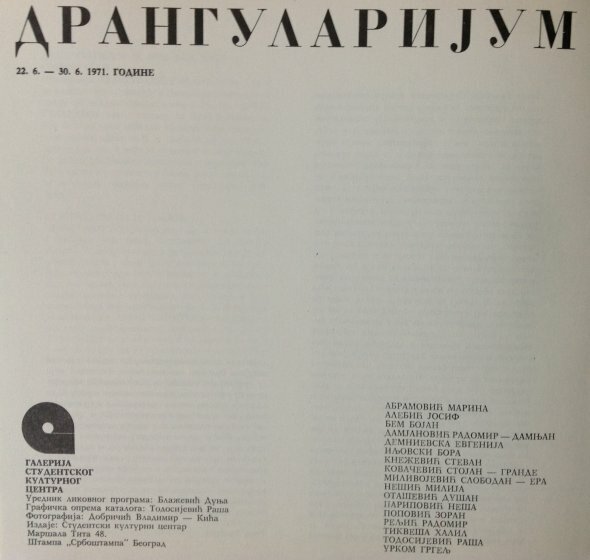 It was actually the first elaborate art-historical summary of New Art in a Yugoslav context, which preceded the two similarly comprehensive surveys of art of the 1960s and ’70s: the famous exhibition New Art Practice in Yugoslavia 1966–1878, curated by Marijan Susovski in the Gallery of Contemporary Art, Zagreb in 1978;5 and the equally significant and much referenced 1983 exhibition New Art in Serbia 1970–1980, curated by Denegri and presented in three institutions, the Museum of Contemporary Art – Belgrade, Gallery of Contemporary Art – Zagreb, and Art Gallery – Prishtine. 2 The board of SKC was not an official body, but a spontaneous one. 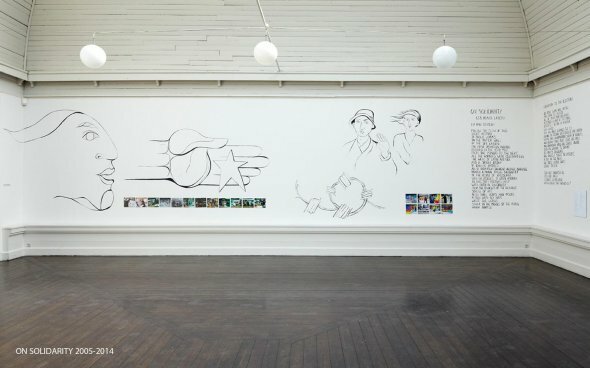 It included artistic community gathered around the gallery—artists, critics, and curators—who influenced the program by making suggestions and through discussion. 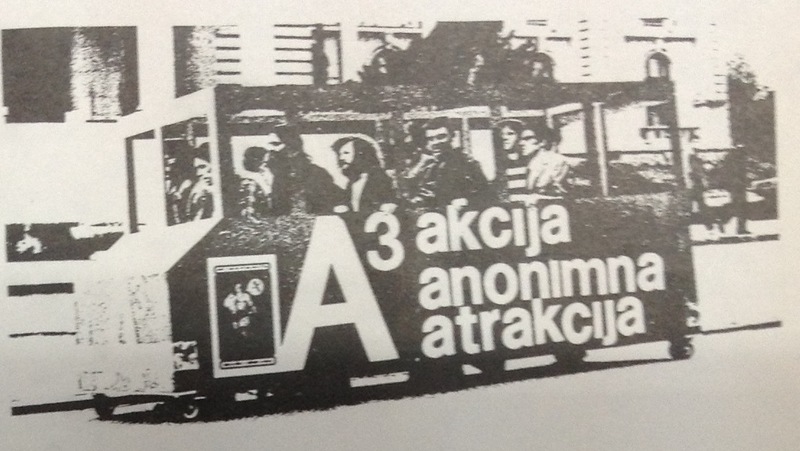 They called themselves Redakcija (“redaction”). 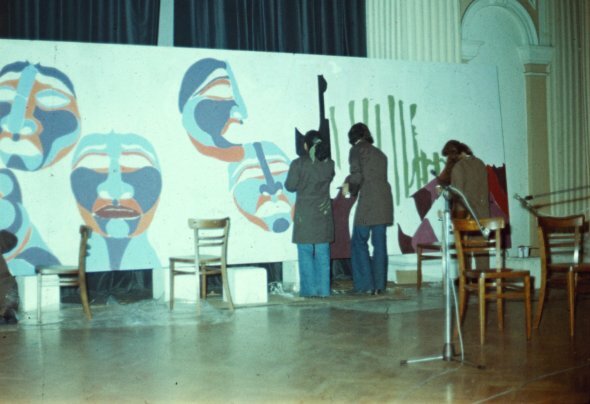 In contrast to other galleries and museums, in Yugoslavia and also abroad, where the program is planned well in advance, SKC had flexible programing. 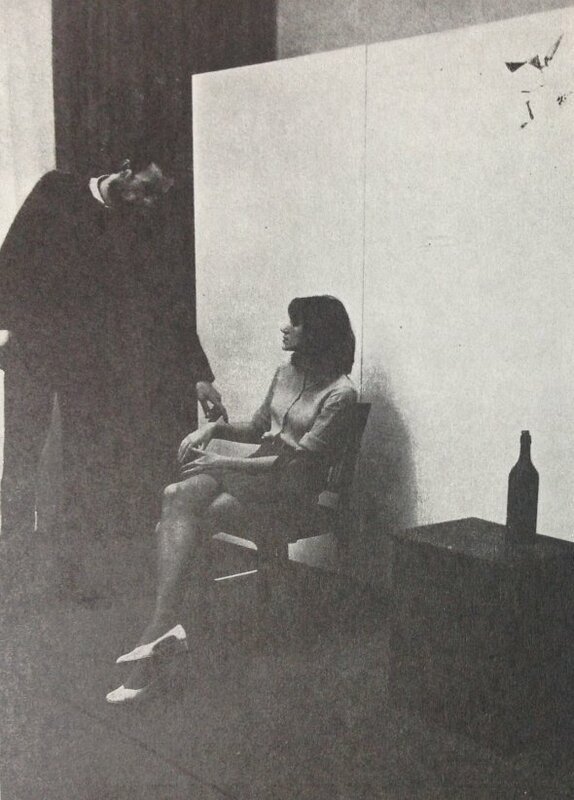 Although the programs were planned ahead, it was also possible to realize an idea for an exhibition or a discussion within the couple of days, instead of waiting for another year. The gallery, therefore, maintained certain responsiveness toward the flux of ideas and the actuality of social and artistic events. 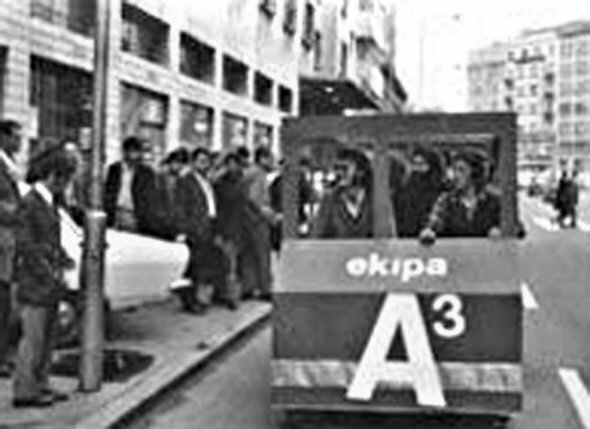 3 Stated by Kustosko veće Muzeja savremene umetnosti – Beograd (Curatorial Council of Museum of Contemporary Art) in the press release for the exhibition (my translation). 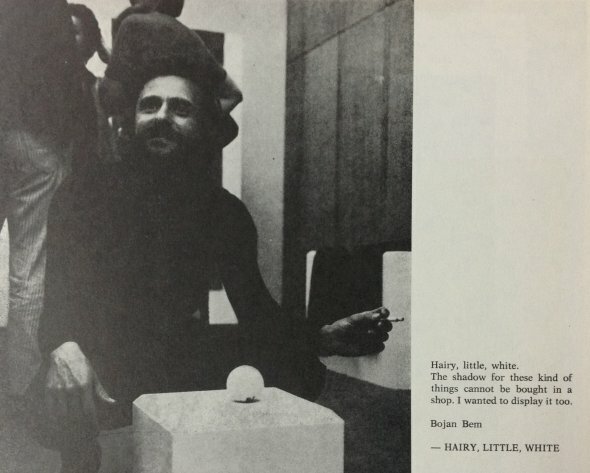 4 All of the following quotations in this section are taken from the accompanying exhibition catalogue to Young Artists and Critics 71, published by the Museum of Contemporary Art in February 1972. 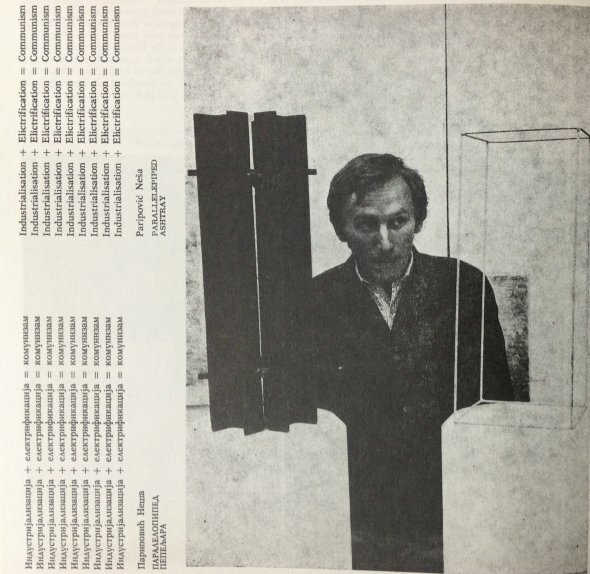 5 The introduction to the exhibition catalogue of New Art Practice in Yugoslavia 1966–1878 can be read here. 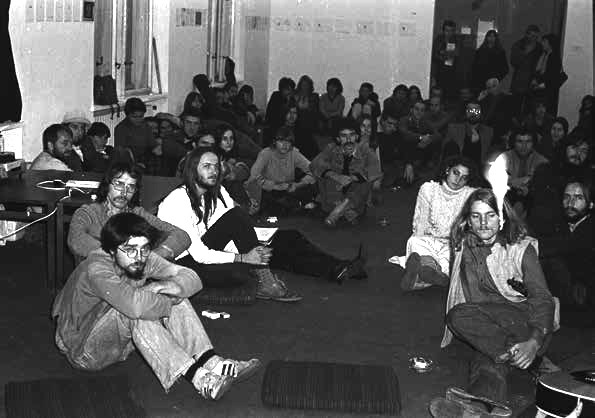 Programmatically and ideologically, the Objects and Projects differs from the rather horizontal and participatory form of “playful collective practice” manifested by the exhibition Drangularijum, presented just a few months before. It makes the shift from an inclusive model of experimental exhibitions by young artists gathered around SKC gallery toward a more professional, individualistic, and conceptually articulated form of New Art. 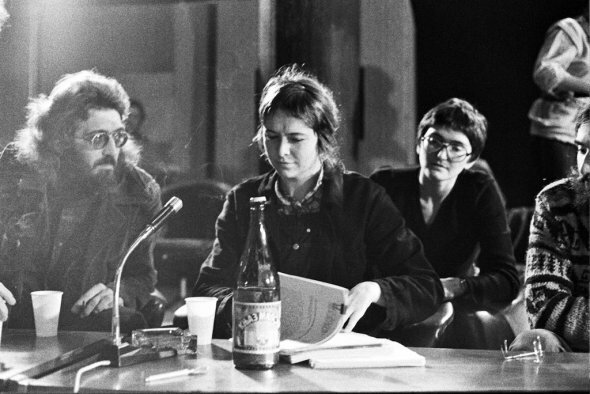 This shift mirrored the attitudes and ambivalences inscribed into the “experimental institutionalism” of SKC since the very beginning. 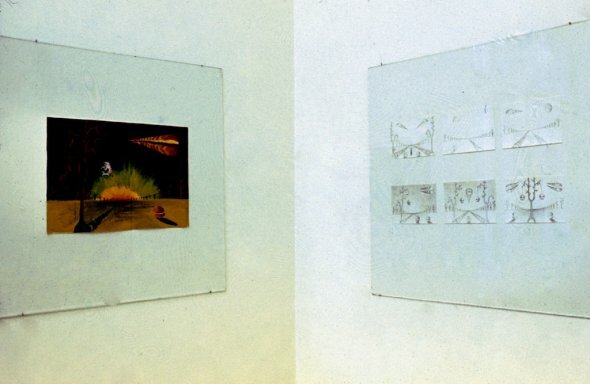 In my introductory text to this exhibition chronology I examine this specific modus operandi where simultaneity of horizontal and vertical forms of organization blur the possibility for more experimental exhibitions to be clearly situated on either side of the binary opposition between institutional versus self-organized. 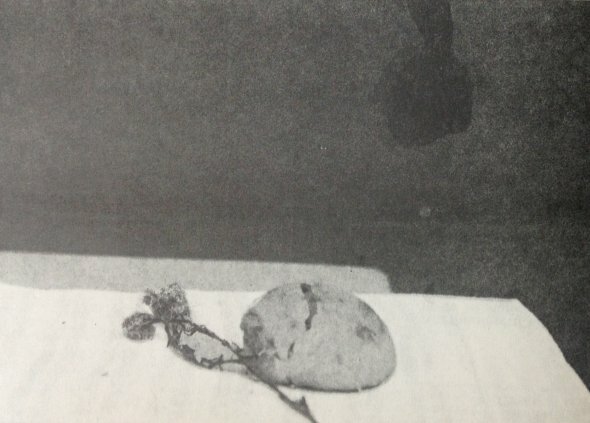 This ambivalent situation is also captured in the documentary photographic material of the SKC artistic community (analyzed in the introductory text), which is simbolically, in terms of cultural representation, connected to two different modes of presentation of art and institutional practice exemplified by Drangularijum and Objects and Projects. 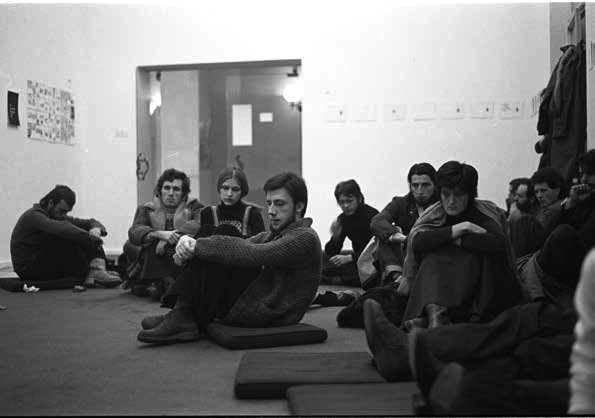 The collectivity of te SKC artistic community is represented in Milan Jožić’s famous photo of people “who used to be there” (in SKC), “who used to be that institution” (the photo is reproduced in the introduction text). 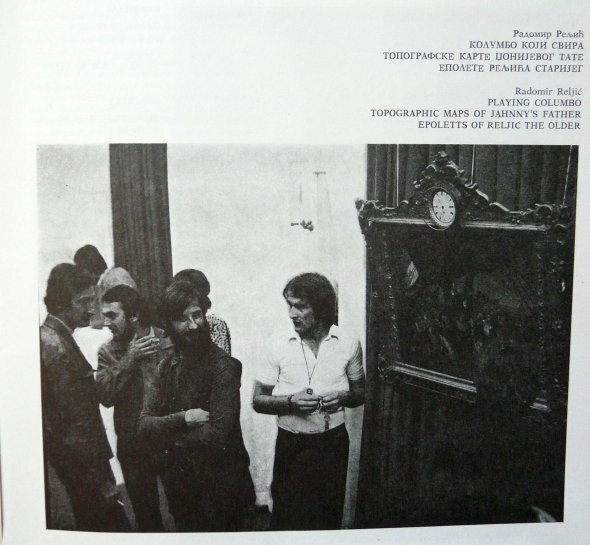 The second photo by Jožić, made during the same session, represented the six most distinguished artists in the eye of art critics and curators of the time—the photo of the Belgrade Six (the photo can be found among the images accompanying this article). 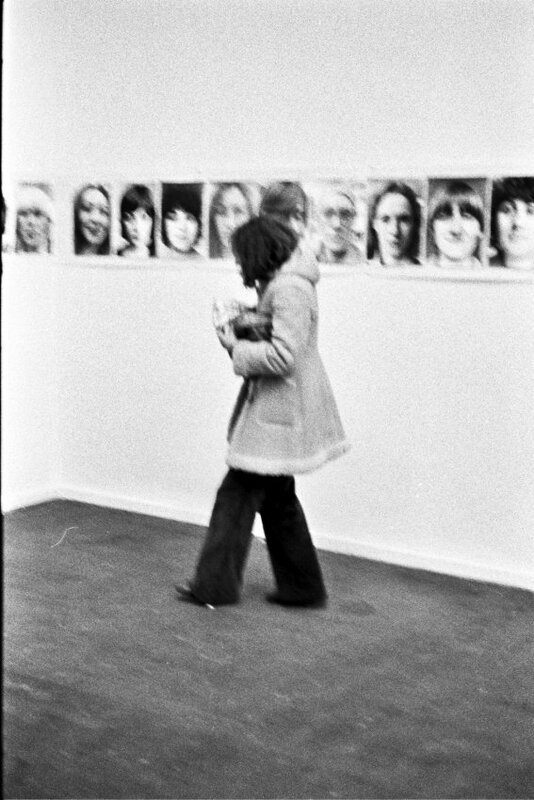 A larger selection of photographs from the opening and closing of the exhibition Objects and Projects can be found in the archive of SKC here. 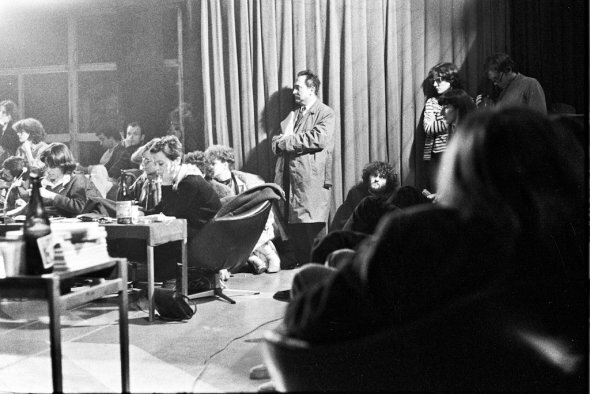 2 Starting the first historicization of the New Art Practice in Yugoslavia, the Belgrade Six Artists appear as the main protagonists of the SKC art scene in both critical writing and historical exhibition records. 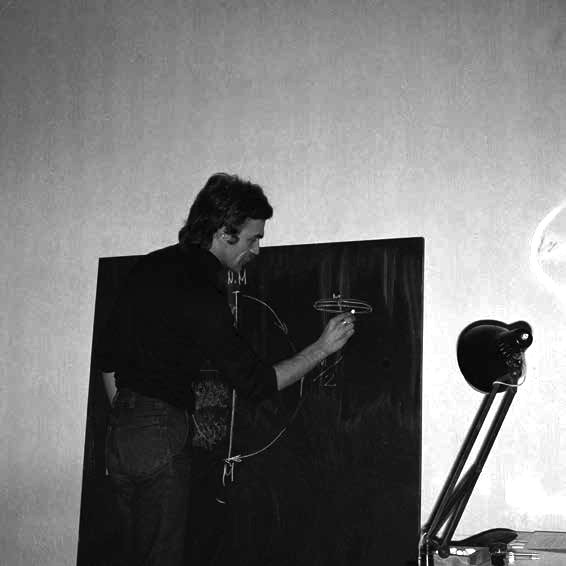 We can trace this history from the Documents on Post-Object Phenomena in Yugoslav Art 1968–1973, curated by Ješa Denegri in the Museum of Contemporary Art in 1973 (its summary can be read here), to more elaborate exhibitions such as: New Art Practice in Yugoslavia 1966-1878, curated by Marijan Susovski in the Gallery of Contemporary Art, Zagreb, 1978 (the introduction can be read here), or New Art in Serbia 1970–1980, curated by Ješa Denegri and presented in 1983 at the Museum of Contemporary Art, Belgrade, Gallery of Contemporary Art, Zagreb, and Art Gallery, Prishtina. 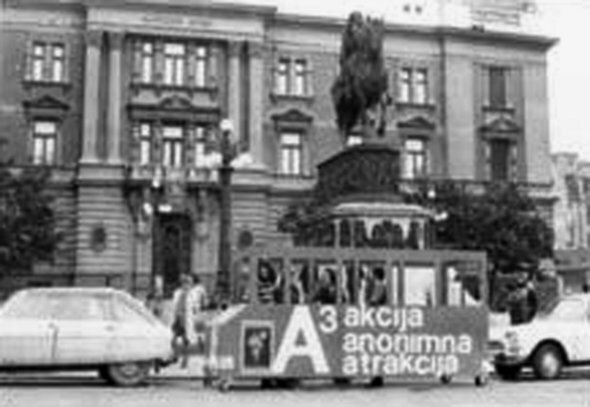 In the words of its editor Milo Petrović, the Tribune program in Belgrade’s Student Cultural Center (SKC), “between mid-1970s and mid-1980s offered a site of free-minded public speech, intellectual debate and social activism, aiming to engage with primarily students, but also with a wider, general public.” Developed in line with other, more art-oriented programs, the Tribune took the task of providing the support for social-critical theory and political theory produced and observed by young intellectuals and political activists from Yugoslavia and abroad. 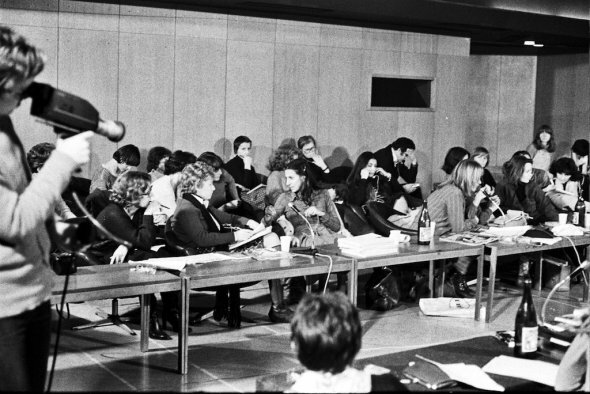 Between mid-1970s and mid-80s, the Tribune program presented several conferences and events: the Week of Spain in 1976, coinciding with the end of Franco’s dictatorship; The Week of Latin America in 1977, dealing with the anti-colonial struggle of different militant guerrilla movements in various parts of Latin America; the first “women’s questions” have been opened in 1978 through the conference Comrade Women, after which followed the event dedicated to militant revolutionary Chilean cinema – The Second Week of Latin America at the beginning of 1980s. 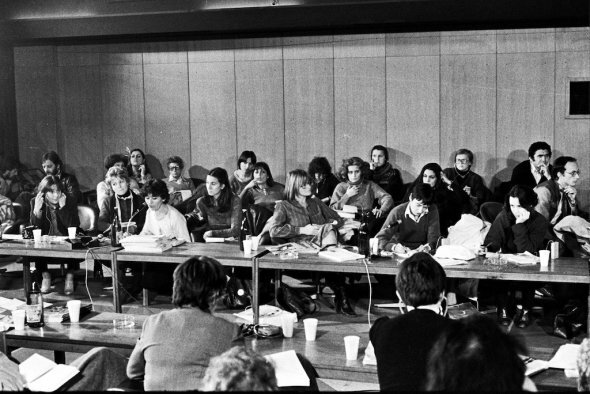 New movements in psychiatry (or more precisely the positions and attitudes of anti-psychiatry) were discussed in 1983, while events in 1984 were dedicated to the critique of the Yugoslav society at the time. 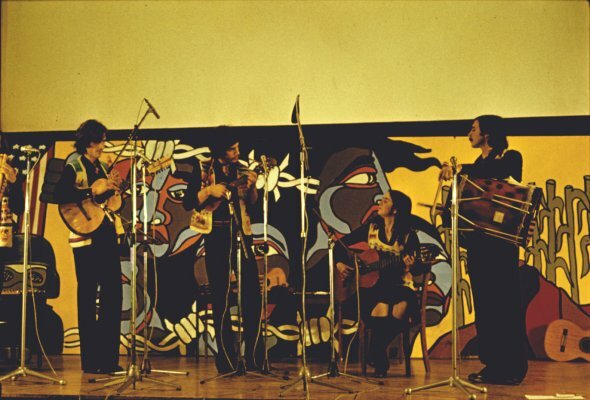 The artistic program of The Week of Latin America comprised a music section, film section, and a visual-arts section. 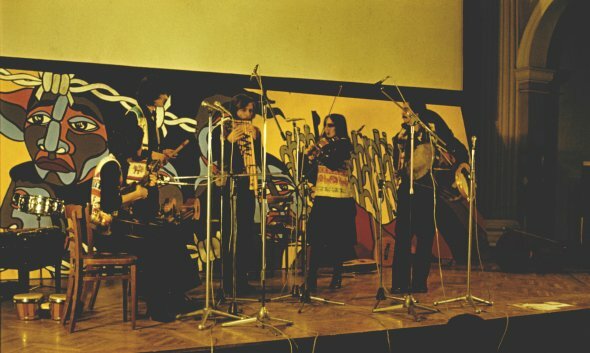 According to the program organizers and SKC editors of the time, the program was framed under the notion of engaged art practice with a “tight connection between artistic and revolutionary act.” The music program featured the guitar player Chango Cejes from Argentina, the band Carcasu from Chile, and Julia Alfonso from Mexico. 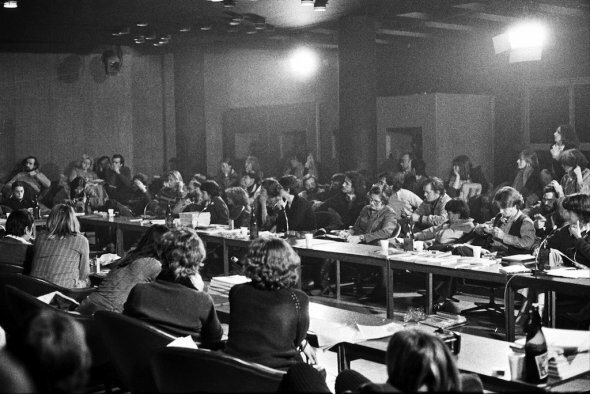 The film program put into the focus documentary and revolutionary propaganda films from Cuba, Chile, Germany, Mexico, and France, to deal with the various struggles in Latin American countries. 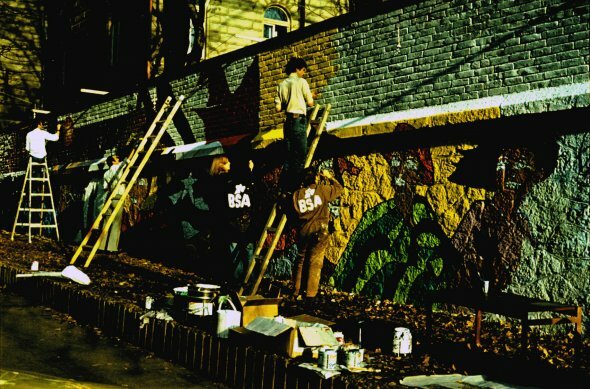 The visual art program included the participation of the artistic (muralist) brigade called Salvador Allende (Ramona Parra), who worked on the streets of Belgrade over the two weeks in collaboration with the students of Belgrade Academy of Fine Arts. 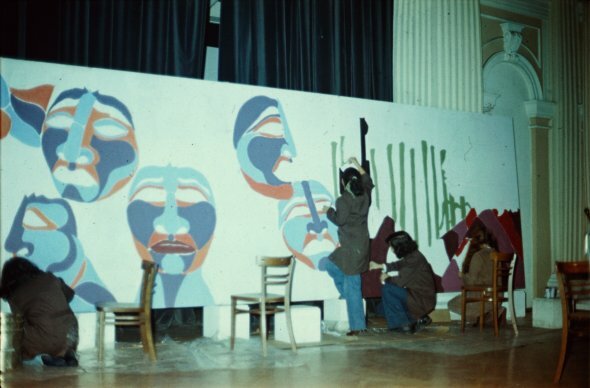 They painted three large-scale murals: one was made on the wall of SKC building (overlooking the inner courtyard that was at the time understood as the place for informal gatherings and as meeting point of young people visiting SKC programs); another was painted on the plaster tiles placed in the interior of SKC; and the third was produced on the wall of the cafeteria in the Faculty of Political Sciences, Belgrade. 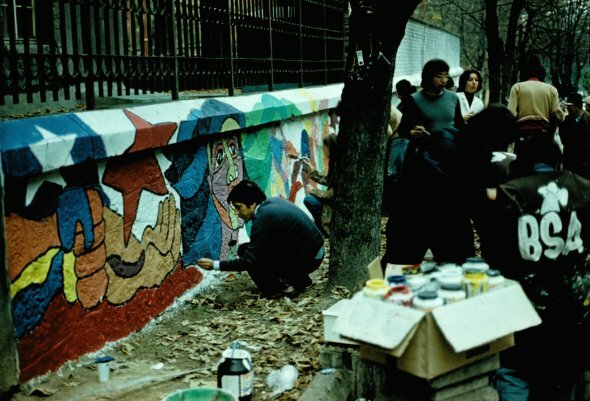 The programmatic concept of the murals and the artistic-political position of the members of the Salvador Allende (Ramona Parra) brigades are described in the TV reportage, broadcasted on the occasion of the week of Latin America. 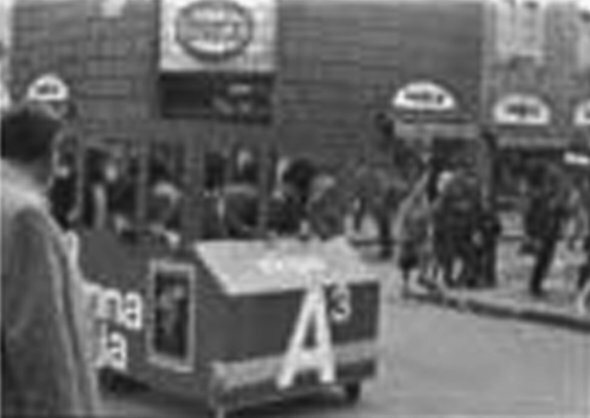 The project on Latin America and the works of the Salvador Allende Brigade are also interesting in this analysis of the exhibition history of SKC as examples of certain politics of art that were framed in a quite of a different manner in comparison to what was happening in the gallery program of SKC, which at the time assumed a variety of artistic and political positions but mainly dismissed such “explicit political activism” and “traditional pictorial expression.” This again points to the hybridity of SKC and the lamination of different positions of critical art and intellectual communities that coexisted in the same space. 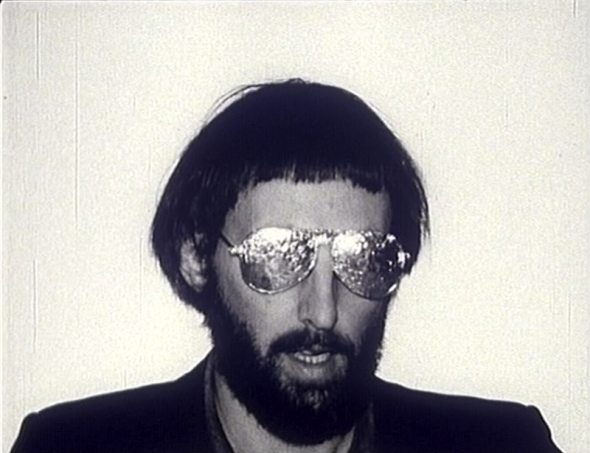 Milo Petrović, quoted in the television program Trezor on RTS, April 10, 2007. 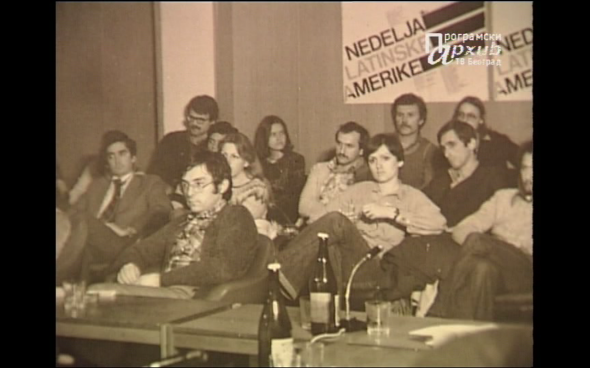 The topic of the show was Alternativni univerzitet – istorija SKCa (Alternative university: The history of SKC). As I commented on in the introduction text to this chronology, the SKC was funded partly by the state and partly through proactive fundraising. 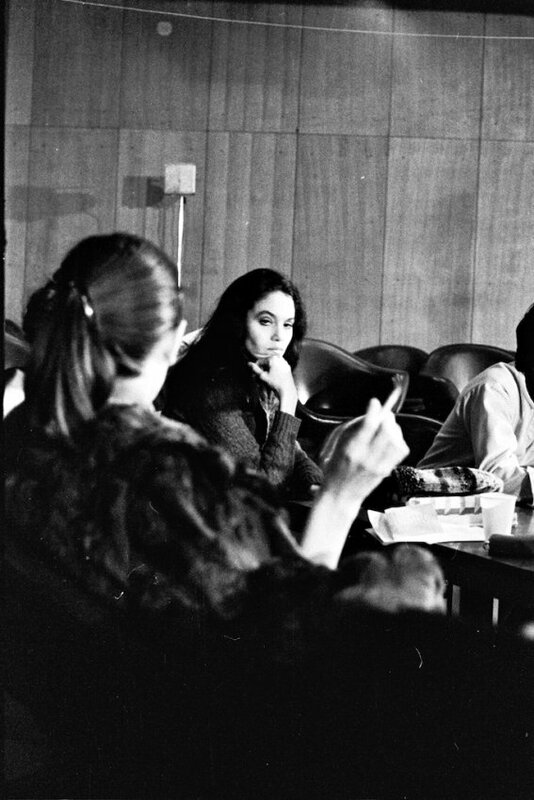 Since it supported numerous international programs and insisted on international collaborations in contrast to the majority of bigger state institutions that presented local art and sometimes diplomatic, state-exchange exhibitions and programs that already had financial support, SKC editors often fundraised at the international embassies, cultural centers, or institutes whose funds were opened toward such initiatives. 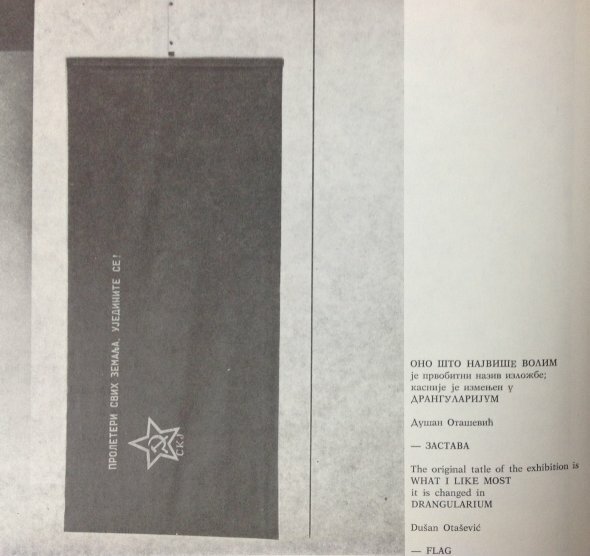 However, majority of the institutional reports catalogued in the SKC archive describe the Yugoslav state as the “main sponsor,” although the addressee is not mentioned directly, and all the reports are written in the fashion of a “summary” or notes from the event. 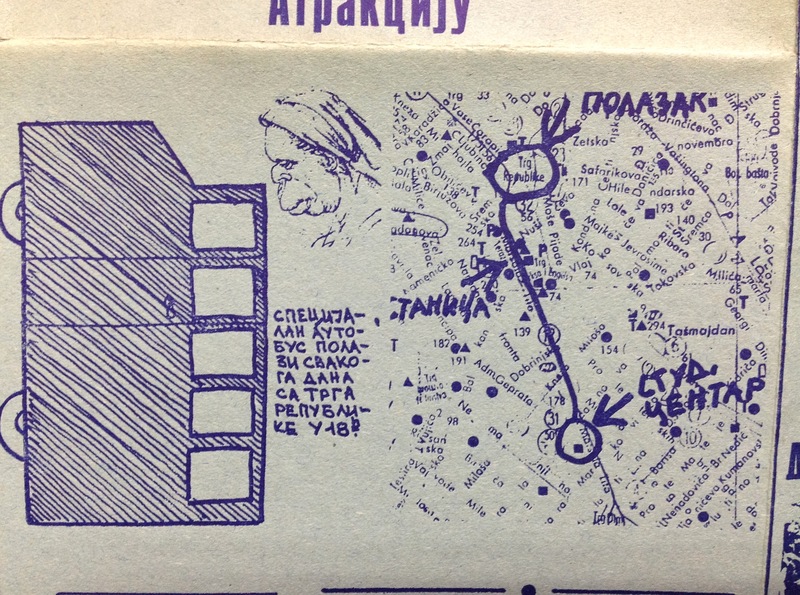 Note on translation: this report sources foreign names phonetically in Serbo-Croatian. 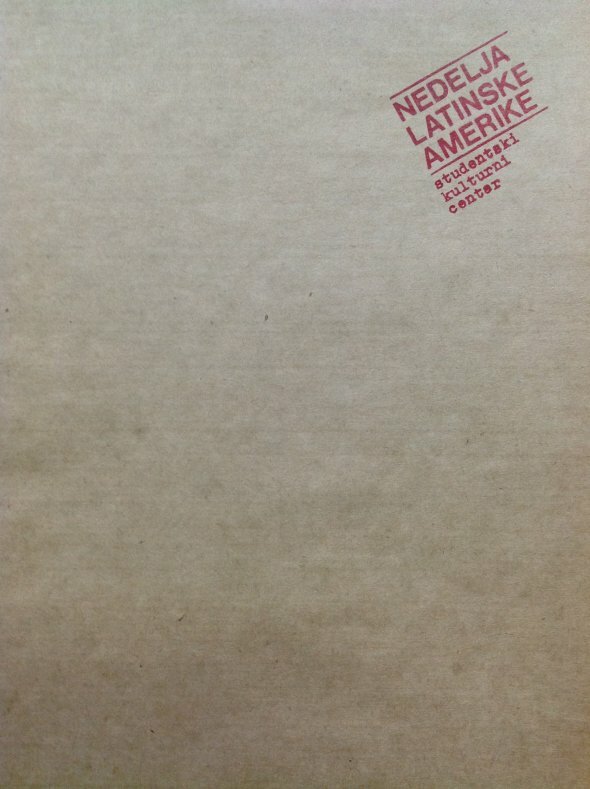 The exact names of the authors are absent in the reports on the Week of Latin America and difficult to find in the SKC archive, which is not yet systematized. Quoted from Darinka Pop-Mitić’s artist statement. 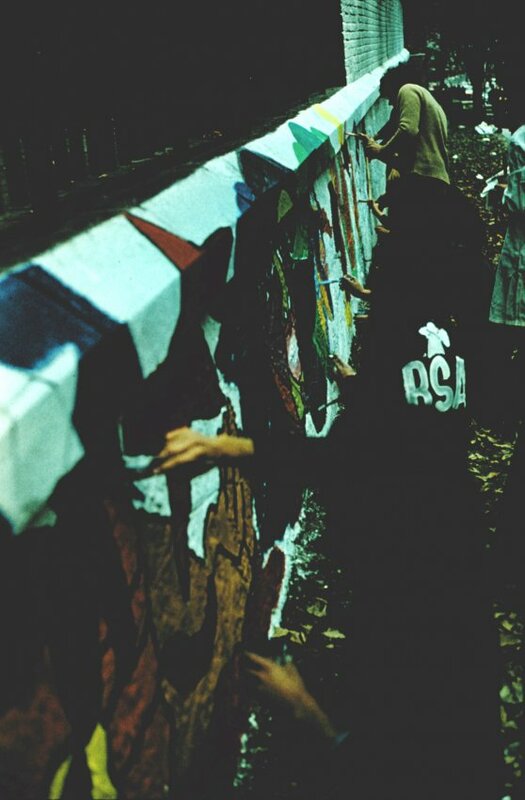 See the introduction to this exhibition chronology, The Student Cultural Center (SKC) as the Art Scene. The Seminar by Group 143 was conceptualized as theoretical artistic event. 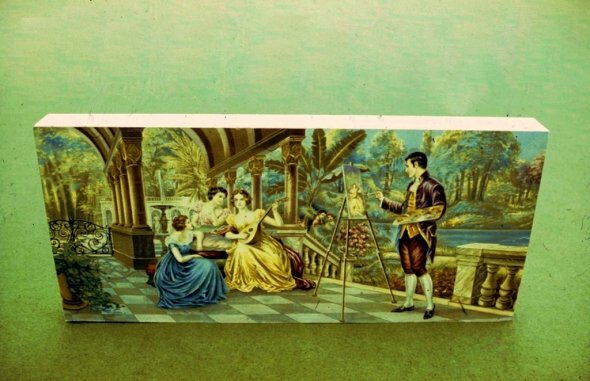 It was paradigmatic for the work of the group whose main artistic medium was conversation, and as such, events were often presented in the form of artistic seminars and theoretical performances. 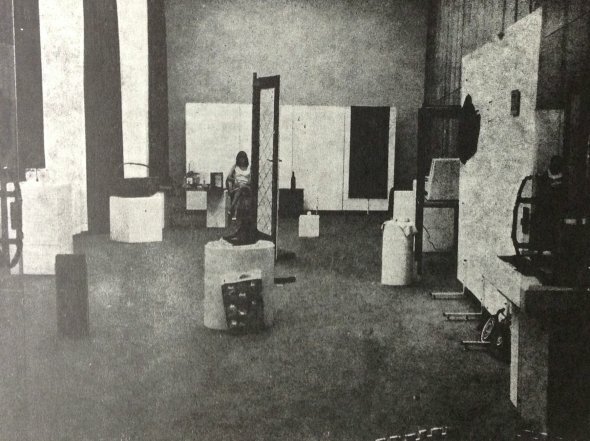 The Seminar in SKC was an exploration of various formal, semantical, and contextual issues of art placed behind the “surface of visible” of an art object (as the assumed fetish of modernist aestheticism). 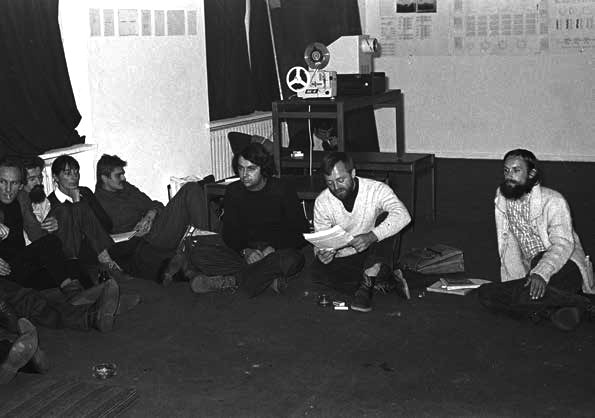 Artists, critics, and philosophers—members of Group 143 and their guests from Šempas and Zagreb—were interrogating and performing different artistic, philosophical and logical questions, emphasizing process-based work (or thought) and focusing (aesthetically) to the very process of lecturing. Some of the investigations by participants of the Seminar unfolded under titles such as “Specific character of the structure or of the process,” “Specific character of meaning,” “Theory of numbers in the domain of visible-sensible manifestations,” “History of art as the process of education of the humankind,” “The art of nature and the art of man,” and so on. 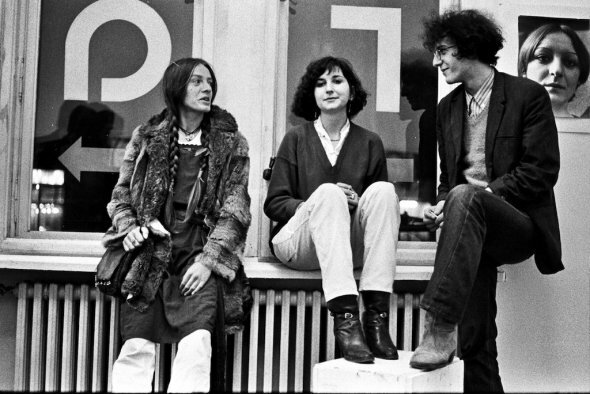 Group 143 was established in 1975 by curator and art critic Biljana Tomić, one of the most influential figures in the history of Student Cultural Center (SKC), Belgrade, who became head of the visual arts program at the end of 1975, when Dunja Blažević moved to the directorial position of SKC. 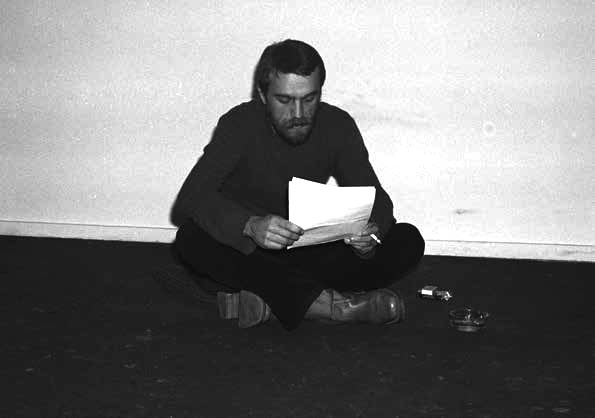 Tomić was also one of the editors of the Likovni program of the Belgrade International Theater Festival (BITEF), which was the visual arts program organized by Atelier 212 as an accompaniment to the festival of avant-garde and experimental theater, held in Belgrade since 1967. 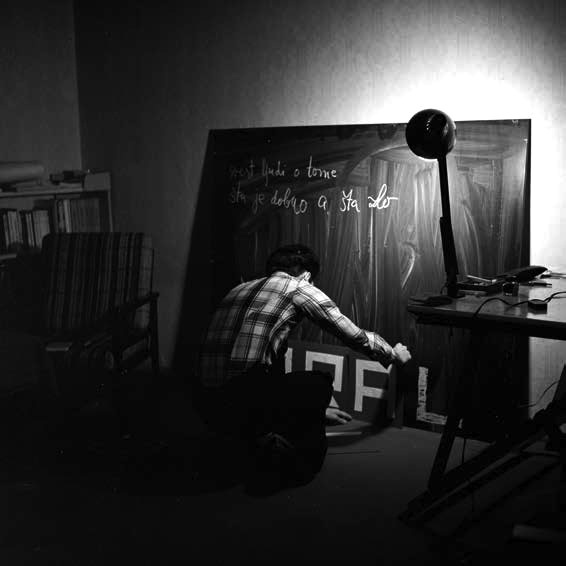 Within the context of BITEF and Tribune of Youth, both predating the establishment of the SKC gallery, Tomić organized different projects of experimental art, collaborating with early Yugoslav conceptualists (OHO, Braco Dimitrijević, Goran Trbuljak, KOD Group, Group E, etc. 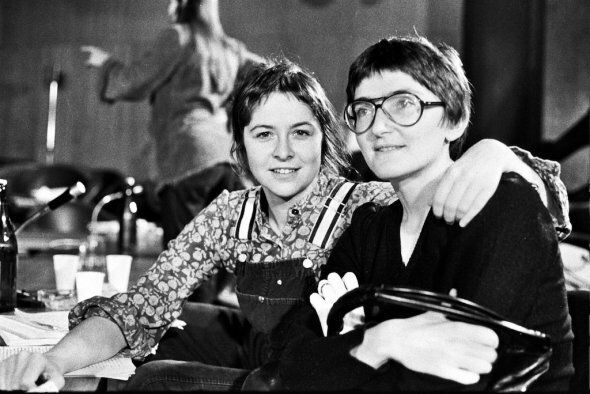 ), and presenting various actors from the international art scene—from performance artists to protagonists of Arte Povera and Conceptual art (Michelangelo Pistoletto, Jannis Kounellis, Daniel Buren, Germano Celant, Catherine Millet, etc). 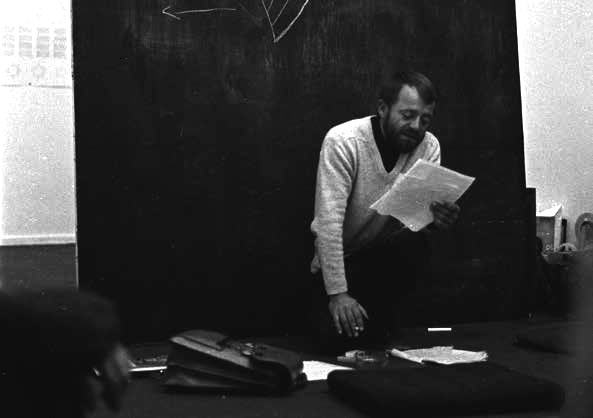 At the time, Group 143 was joined by young philosophers and artists who were often influenced by analytic philosophy and logical positivism—among these were Jovan Čekić, who later called himself a media theorist and artist, and Miško Šuvaković, who later became a significant theorist of the art of 1960s and 1970s in both the Yugoslav and international context. 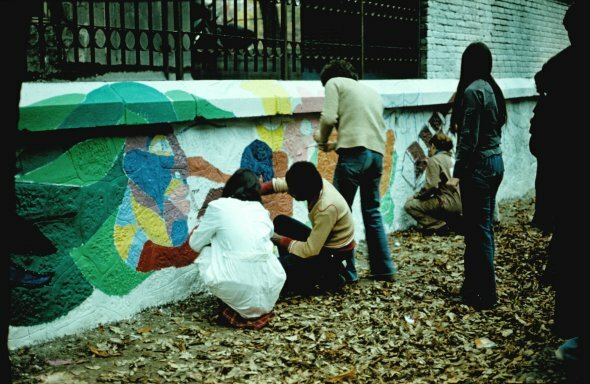 Group 143 continued working until the 1980s. 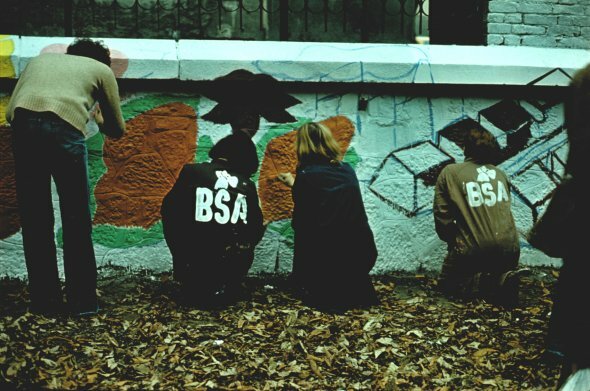 One of the reasons why the members of the group dispersed was, according to the statements by its members, the perceived lack of interest in conceptual thinking within contemporary art production at the turn of 1980s, and their refusal to participate in the new “paradigm shift” that lead to the supremacy of painting. 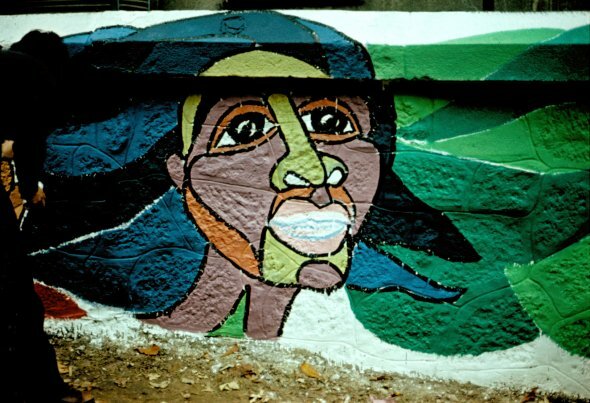 This particular period was marked by the return to image and painting, which, in the local context and within the microclimate of SKC, was probably fostered by visits of Achille Bonito Oliva, and promotion of the concept of Transavanguarde by the local critics and curators, including those who supported New Art in the 1970s. 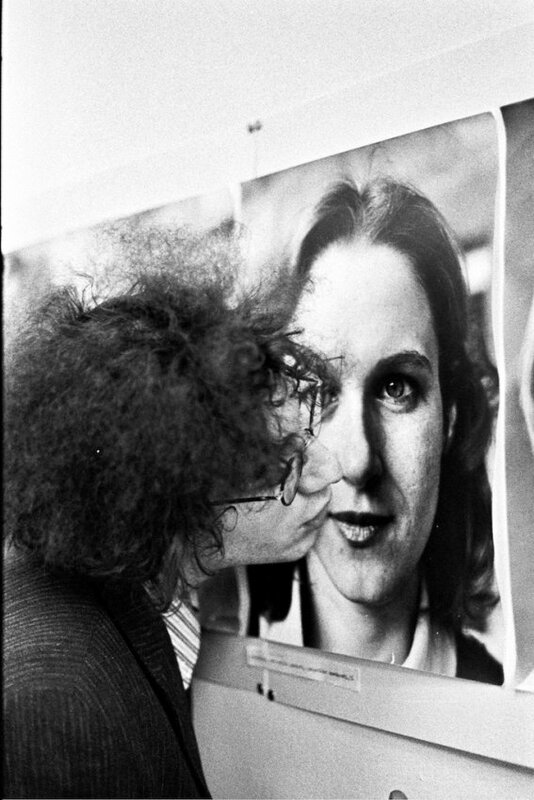 Miško Šuvaković, Konceptualna umetnost (Novi Sad: Muzej savremene umetnosti Vojvodine, 2007), 308. 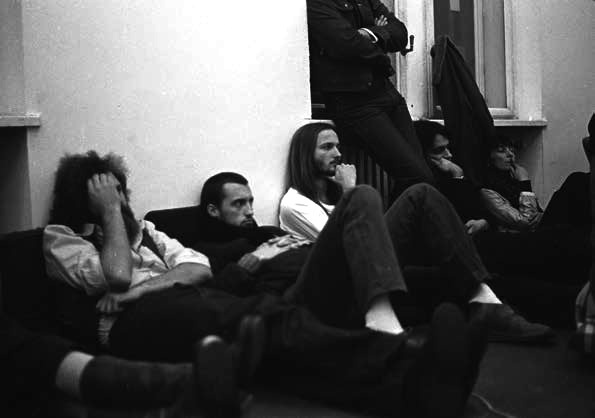 Participating artists and critics: Aalders Franklin, Abramovic Marina, Andel Jaroslav, Attalai Gabor, Bartos Peter, Belic Zoran, Beres Jerzy, Body Gabor, Cardena Warming Up…., Demur Boris, Denegri Jesa, Djordjevic Goran, Nusa & Sreco Dragan, Durcek Lubomir, Dziamski Grzegorz, Erdely Miklos, Galeta Ladislav, Gotovac Tomislav, Antje von Graevenitz, Gribling Frank, Grinberg Bucky, Gudac Vladimir, Hajas Tibor, Haka Janusz, Halasz Karoly, Havrilla Vladimir, Hawley Martha, Hay Agnes, Hegyi Lorand, Hoover Nan, Ivekovic Sanja, Jenssen Servie, Jaworski Cezary, Jovanovics Gyorgy, Jozwiak Jacek, Karolyi Zsigmond, Kelemen Karoly, Kern Michal, Knizak Milan, Koller Julius, Konart Tomasz, Kostovowski Andrzej, Kovanda Jiri, Harrie de Kroon, Kutera Romuald, Kwiek Pawel, Kwiek Przemyslaw & Kulik Zofia, Lachowicz Andrzej, Leering Jean, LL Natalia, Marroquin Raul, Martinis Dalibor, Maurer Dora, Mikolajcick Antoni, Miler Karel, Mlcoch Jan, Mrozek Lech, Murak Teresa, Paruzel Andrzej, Peeters Sef, Pinczehelyi Sandor, Pogacnic Marco, Reindeer Werk, Richter Jaroslav, Robakowski Jozef, Sikorski Tomasz, Sosnowski Teresa / Zdzislaw, Stilinovic Mladen, Stembera Petr, Straus Tomas, Susovski Marijan, Szczerek Janusz, Sziranyi Istvan, Todosijevic Rasa, Tomic Biljana, Tot Endre, Ulay, Valoch Jiri, Veto Janos, Warpechowski Zbigniew, Wasko Ryszard, Albert van der Weide, Zarebski Krzysztov, Zbornik Dobra. The exhibition Works and Words, organized in Amsterdam’s De Appel Foundation, in the words of it’s organizers aimed at “creating confrontation between artists who share a common sensibility from Hungary, Czechoslovakia, Poland, Yugoslavia and the Netherlands. 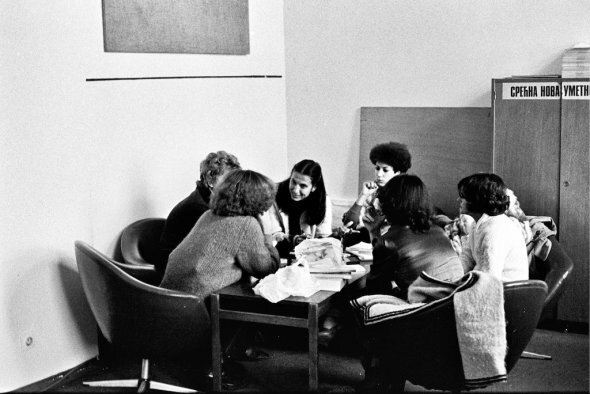 It was a manifestation which focused on the dialectical interaction of reflection and action, of works and words”. 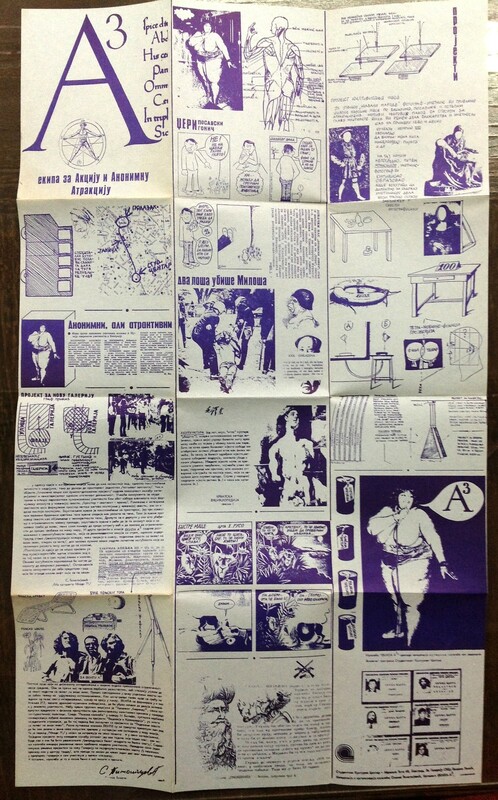 The exhibition program and information on participants can be found in the original leaflet attached here, while De Appel archive provides a short description, accompanied by several images and videos. 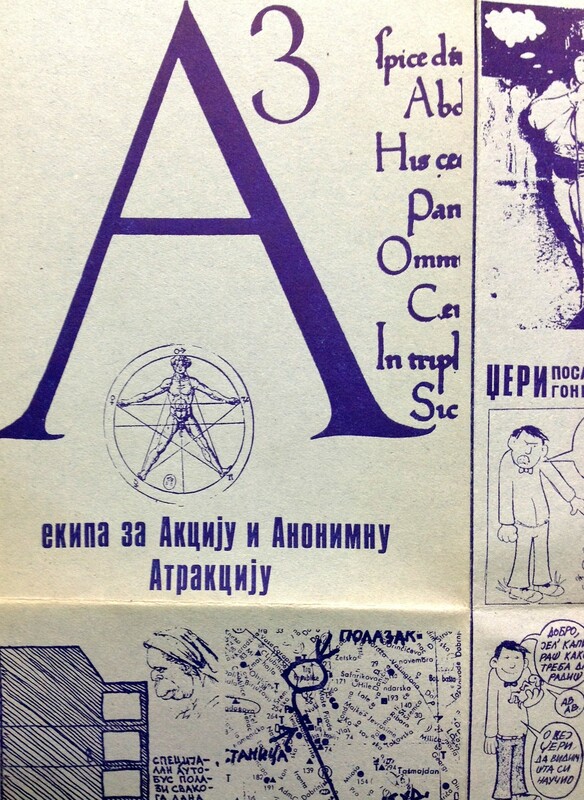 At the first glance, Works and falls out of the story on different aesthetical-political positions and trajectories of New Art in Student Cultural Center – Belgrade (SKC), which is the main theme of the selection of projects presented in this archive. 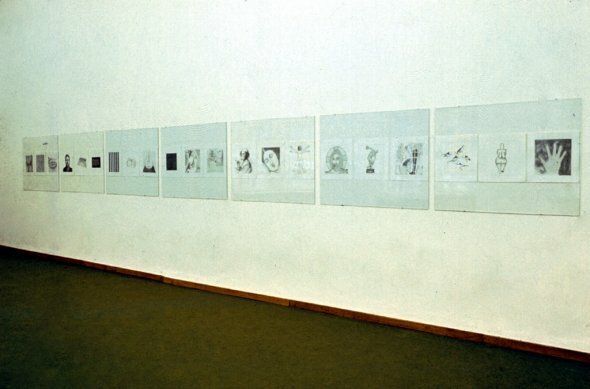 The exhibition, presented in 1979, approaches this field of observation laterally, as it has to do with the various developments (’the works and words’) of certain artists and critics from former Yugoslavia  who participated in the program of SKC or who were broadly connected with the SKC ideosphere . 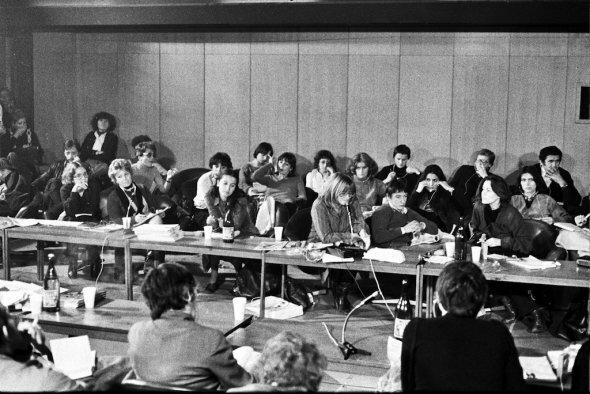 However, what is more interesting within the context of this archival presentation is that the participation of Yugoslav Artists – and protagonists of SKC scene in particular – had intervened within the conceptual framework of exhibition-in-the-process-of-making. 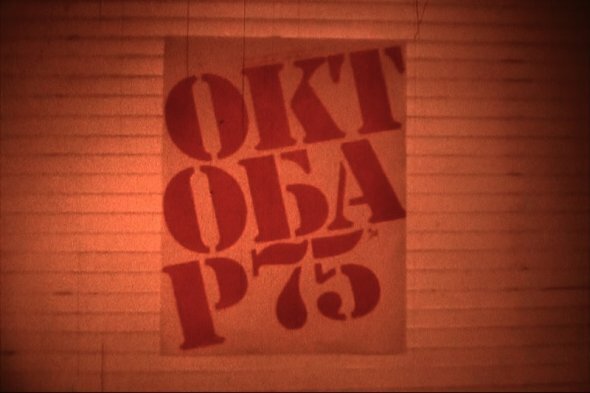 The exhibition was initially conceived as presentation of Eastern European Art, as an event that accumulates its curiousness in the very fact that it presents the art from ‘behind the Iron Curtain’, as ‘something that is rarely seen abroad’, thus offering the presentation context that ‘covers’ the reality of singular artworks by grouping them behind the monolithic banner of dissident art. Some of the artists gathered around the SKC gallery expressed their disagreement with such idea of presentation. 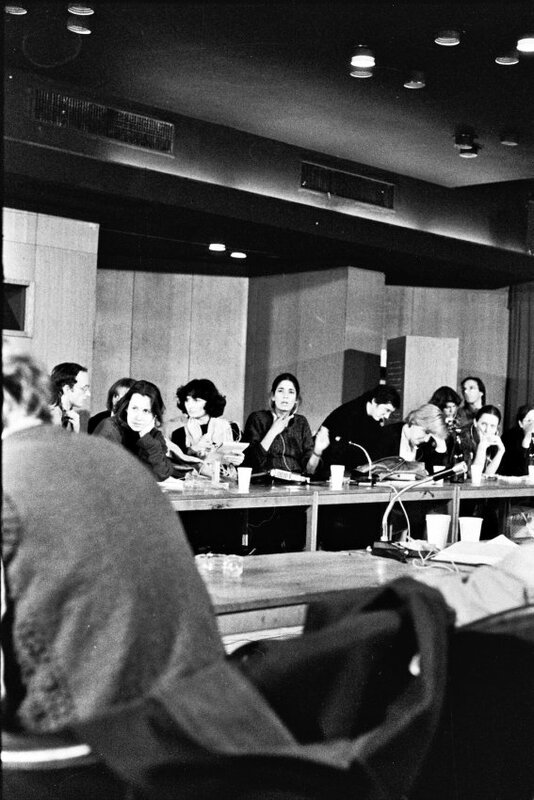 They perceived it as an act of ‘closing particular works by individual artists into an uniform ghetto’, and requested more equality with the Western art context by problematizing its ‘exclusive’ right to recognition of singular artistic positions. 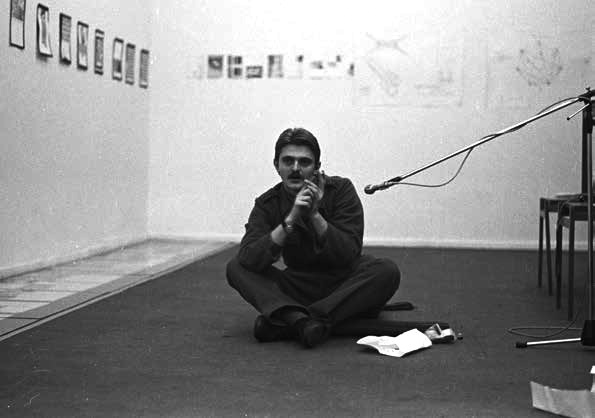 Goran Đorđević, who used to exhibit in SKC from 1973-1985, wrote to exhibition organizers about how such an international context of exhibiting, based on the mimicry of the cold-war geopolitical agenda, actually becomes the only context of presentation on offer for the artists coming from Eastern Europe. 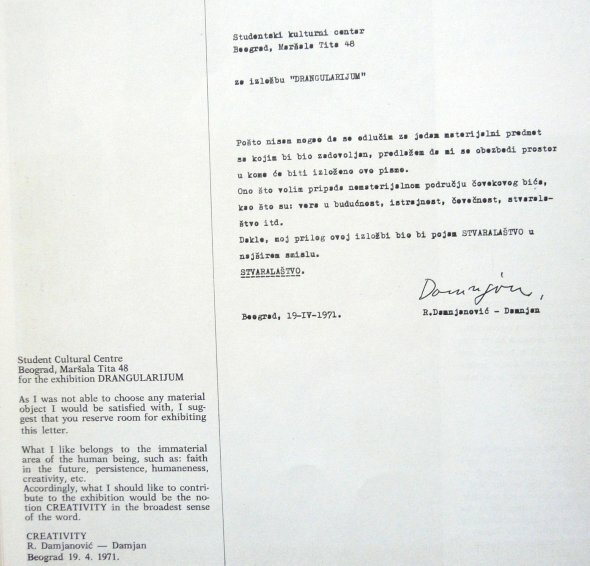 Đorđević’s answer to invitation letter summarized some of the critiques coming from the side of Yugoslav participants: “They (The artists from Eastern Europe) are practically forced to accept any offer since these are rare occasions when their work has a recognized artistic status, and on the other hand, this exhibition should explicitly or implicitly reaffirm the ‘unlimited’ freedom of artistic activities and ‘universality’ of cultural/artistic practice of the West. 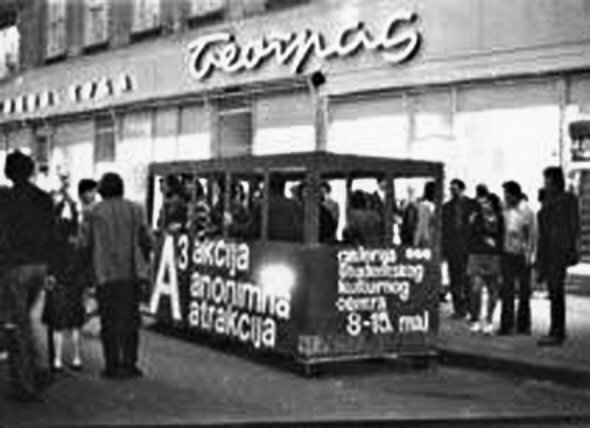 In that way the significance of such ‘ghetto’ exhibition is mainly reduced to its political dimension (dissident, exotic), while the nature of the works themselves, their character and significance, are pushed to background.” After receiving Đorđević’s letter, the exhibition curators changed the initial plan; they decided to avoid framing the exhibition within the expected geopolitical agenda and joined the previously separated group of artists from Netherlands to the general selection; they also have chosen the more ‘universal’ heading – Works and Words – as the exhibition title, and dropped the term of “East European” that was prominent in previous versions and propositions. 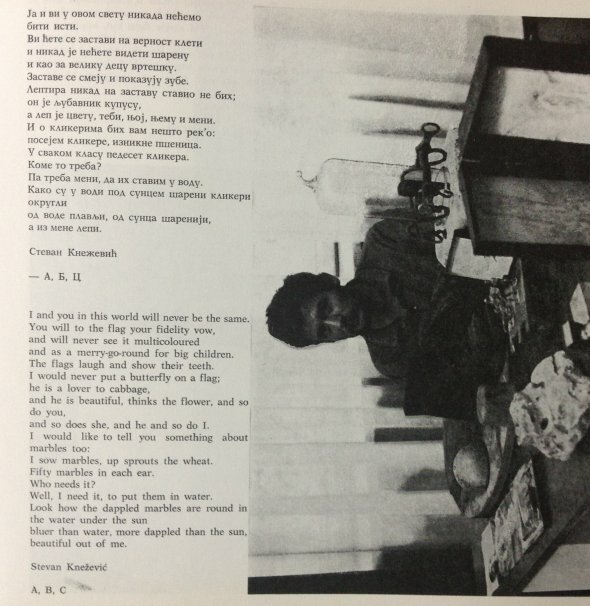 The answer by curator Josine van Droffelaar is included in the photo selection of this article, while the letter by Đorđević is reproduced among archival documents. 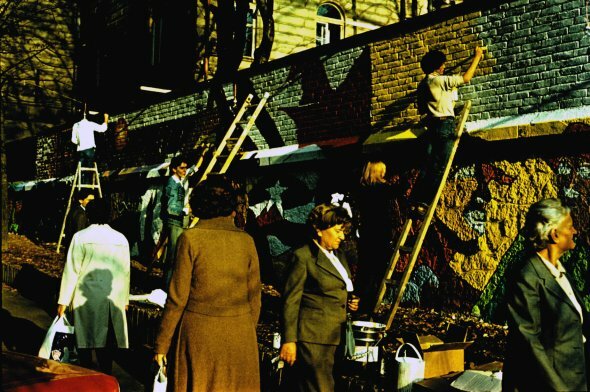 The story behind the exhibition Works and Words is an interesting example, or a comment on the contemporary forms of representation of Eastern Europen art in the (former) West. 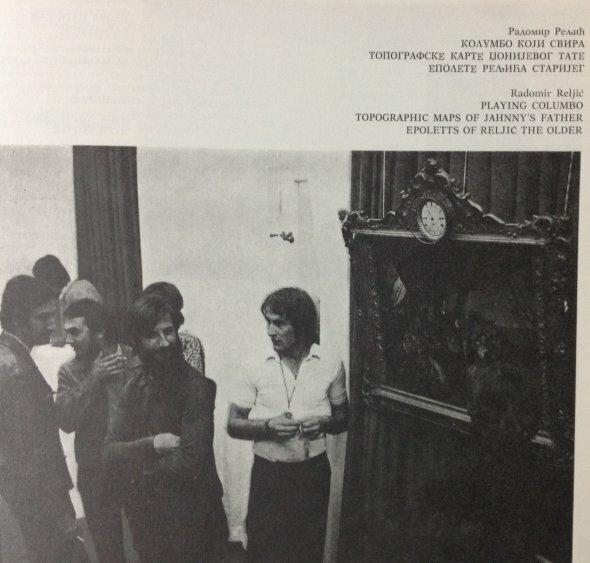 This story announced in a way the re-introduction of the critique of the discourse of Eastern European art in theoretical and art-historical overviews of the exhibition history and art history that emerged after 1989. 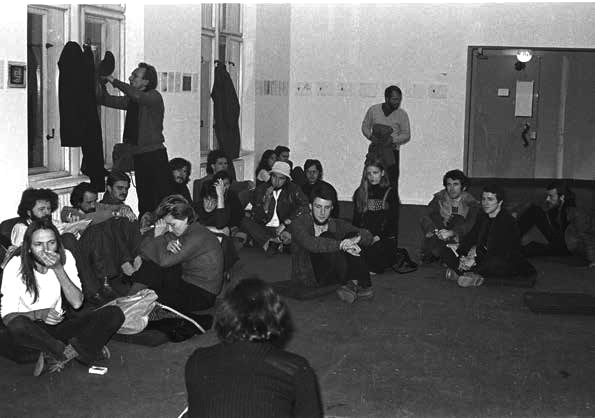 As for the generation of artists gathered around SKC gallery in the 1970s, the exhibition can be observed as the indicator of some of their positions towards the “outside”, towards the context of international presentation and participation in the politics of exhibiting and framing New Art in the European and global context. c.f. curatorial-editorial introduction text, Works and Words (exhibition catalog), De Appel 1980.
 i.e. 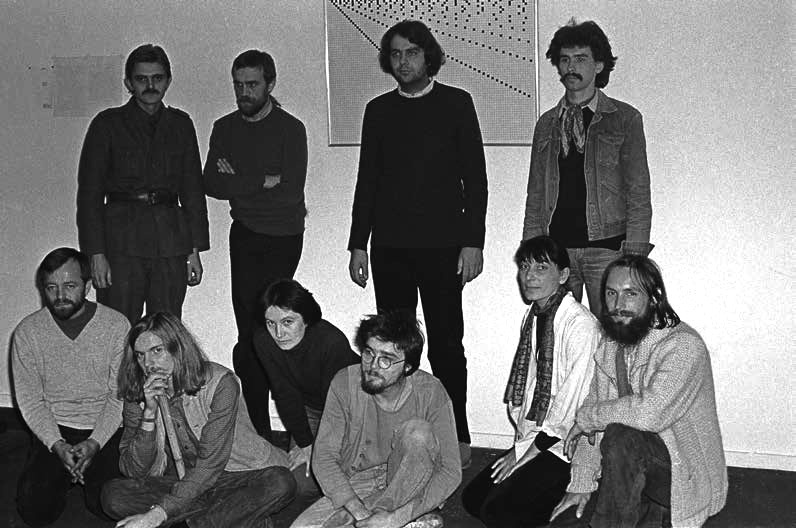 Marina Abramović, Biljana Tomić, Vladimir Gudac, Ješa Denegri, Raša Todisijević, Goran Đorđević, Tomislav Gotovac, Vladimir Gudac, Sanja Iveković, Marijan Susovski, Dalibor Martinis etc. 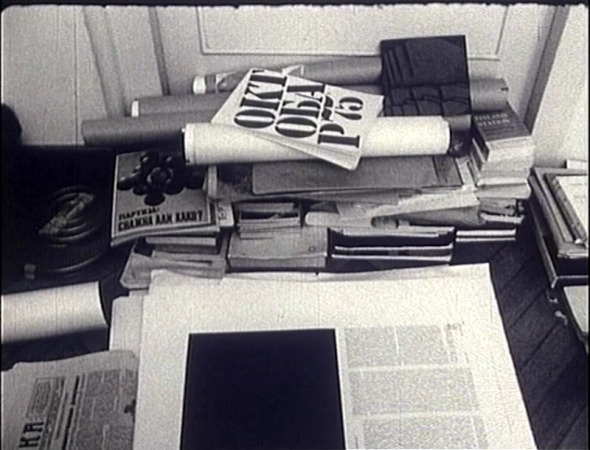 The term Ideosphere is borrowed from the same-titled text by Rolan Barthes. 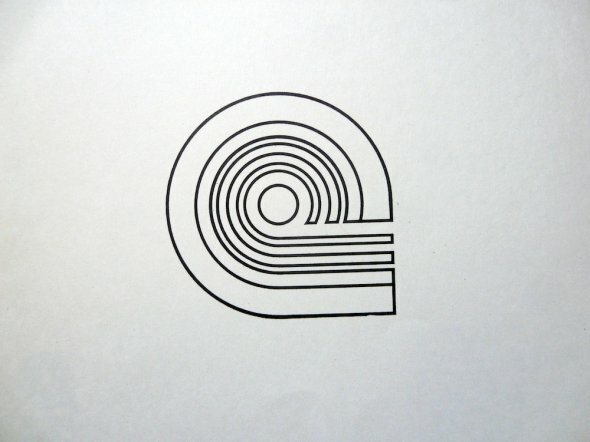 Here in particular ‘SKC ideosphere’ refers to the institutional links between the Student Centers in Belgrade, Zagreb and later Ljubljana, and their various other official or self-organised art spaces supporting the work of young artists; it also refers to the personal relations and friendships among different artists, art groups or art couples living and working in various cities throughout Yugoslavia. 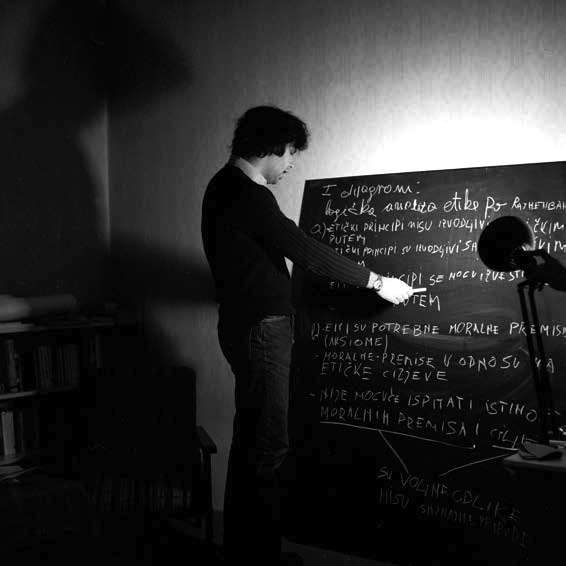 Goran Đorđević leaves the artworld as individual artists in 1985, or – to term it in his own words – he ‘disappears as a character from the artistic scene’. 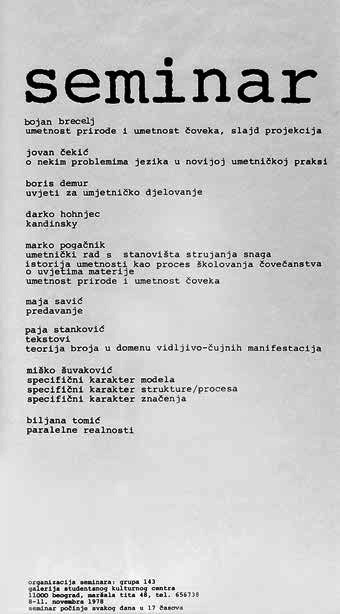 From Đorđević’s letter to the organisers of the exhibition Works and Words.